April 23 (gogo.mn) Today, S.Bayartsogt, Head of the Office of the Government, submitted Tavan Tolgoi coal deposit development measures resolution draft to Z.Enkhbold, Speaker of the Parliament. · construct Railroad to connect Ukhaakhudag to Gashuunsukhait by concession agreement. · Provide coordination of approved resolutions on TT mine deposit before the State Great Khural. April 23 (gogo.mn) Minister of State M.Enkhsaikhan made an announcement just after the Head of the Office of the Government submitted the Tavantolgoi Resolution Draft to the Speaker of the Parliament. What is our wish? We wish for Parliament to come up with a right decision not only regarding the Tavantolgoi, but the decision which will raise the credibility in front of other investors. We wish to show others that Mongolia is capable of implementing mega projects. We are trying to monitor every concern raised in regards with this mega project and we are trying to address every issue. Lately we are disseminating information on how the criticism should be understood and addressed through our website. Cabinet submitted the project related documents openly. Nothing is hidden from the public. Open discussions will be held to discuss the certain provisions of the project agreement. As all the parties of the concession are publicly listed companies at Tokyo, Shanghai and Hong Kong Stock Exchanges, there might be accusations that shareholder rights are being violated. Therefore, it is essential to take all those aspects into consideration. April 23 (Financial Post) Jim Doak, a fixture on Bay Street for more than three decades and most recently a commentator on BNN, has died in Mongolia. The cause of his death is not known though an autopsy is planned. Doak, an analyst with Scotia Capital and First Marathon before becoming one of the founders of Enterprise Capital Management and most recently Megantic Asset Management, was 59. "He was an amazing fellow. He led a full life, lots of charity work, and was one of the best read people that I know," said Peter Foster, an author and FP columnist who met Doak 35 years ago. "I will miss him terribly. He had so many sides to him." Dunnery Best, a former investment adviser with CIBC Wood Gundy in Victoria, said, "He was a superb businessman, a superb brain, extremely erudite, fluently bilingual and a valued friend for more than 35 years." The two met when Doak was a junior analyst at Scotia Capital. He was an amazing fellow. He led a full life, lots of charity work, and was one of the best read people that I know Garrett Herman, chairman and chief executive of LOM Ltd., an exempt market dealer, said Doak "will be missed. You could always rely on him to have a valuable opinion. We had great discussions about everything and anything." Doak, a father of four including twins, was in Mongolia in his role as chairman of TSX-listed Khan Resources, which has been active in that country since 1995. Grant Edey, the company's president and chief executive, was also on the trip. Since 2009, Khan and the government of Mongolia had been in dispute over the ownership and development of the Dornod uranium property. In early 2011, Khan launched a US$326 million international arbitration action against Mongolia for the illegal expropriation of its asset in January 2011. In March, Khan announced that an international arbitration tribunal had rendered a judgment in Khan's favour. At the time the award was worth US$103.8 million. Doak, who after graduation spent two years in the Middle East, was also a director of Quebec-headquartered Cascades Inc., as well as Toronto-based Purepoint Uranium Group Inc. and of Fort Erie-based Eurocopter Canada Ltd., which is part of the Airbus Group. Chris Frostad, chief executive at Purepoint, said Doak, was "a very involved and very attentive director for a decade. He was an early investor and was an invaluable resource during both the good and difficult times. He was very helpful." In the past Doak was a director of PetroKazakhstan Inc., Superior Propane Inc. and Spar Aerospace Inc.
TORONTO, ONTARIO--(Marketwired - April 23, 2015) - Khan Resources Inc. ("Khan" or the "Company") (CSE:KRI) announces that, consistent with its preferred strategy of reaching an amicable settlement with the Government of Mongolia, a second series of meetings with representatives of the Government has now been completed. 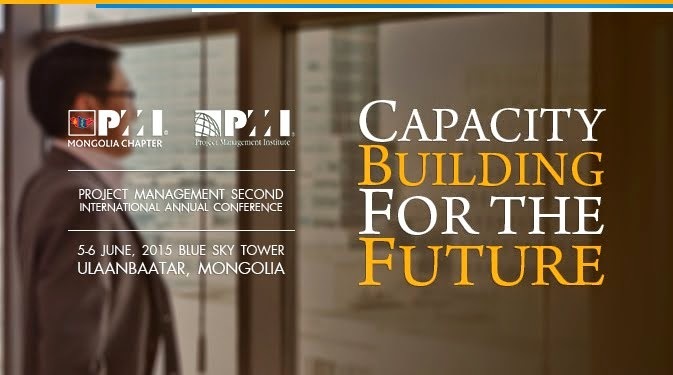 These meetings took place in Ulaanbaatar on April 21 and 22, 2015. The Company has repeated its request for full and prompt payment of the award. With regard to the international arbitration, Khan has been notified by the Tribunal Secretary from the Permanent Court of Arbitration (PCA) that the arbitration proceedings were terminated with the issuance of the Tribunal's Award on the Merits on March 2, 2015. After completing its final accounting, a small reimbursement was provided to the parties by the PCA. On March 2, 2015 the international arbitration tribunal rendered an award to Khan as compensation for the Government of Mongolia's actions in relation to the cancellation of Khan's uranium licenses in 2009. The award consisted of a Base Amount of US$80 million plus interest at LIBOR +2% (compounded annually) from July 1, 2009 to the time of payment. In addition, the Tribunal awarded costs of US$9.1 million in favour of Khan. As of April 23, the award aggregates to approximately US$104 million. Interest is currently accruing at a rate of 2.546% or US$6,485 per day. VANCOUVER, BC--(Marketwired - April 23, 2015) - Turquoise Hill Resources (Turquoise Hill or the Company) today announced that it has completed the divestment for a portion of the Company's stake in SouthGobi Resources Ltd. (SouthGobi) to Novel Sunrise Investments Limited (NSI) for approximately CDN$17.0 million. Half of the aggregate purchase price, representing approximately CDN$8.5 million, was received by the Company at closing and the balance of approximately CDN$8.5 million is payable on the first anniversary of the closing of the transaction. Under the terms of the agreement, Turquoise Hill agreed to sell 48,705,155 common shares that it owned in the capital of SouthGobi to NSI at a price of CDN$0.35 per common share. Following closing of the transaction with NSI as well as their private placement with SouthGobi, Turquoise Hill continues to own 56,102,000 SouthGobi common shares that are subject to a share purchase agreement with National United Resources Holdings Limited (NUR), announced and entered into in July 2014, representing approximately 23.3% of the issued and outstanding SouthGobi shares. In addition, Turquoise Hill has the option (Put Option) to require NSI to acquire an additional number of SouthGobi common shares, up to a pre-agreed maximum number of additional shares and in any event provided NSI will not be required to own more than 29.99% of the outstanding SouthGobi shares following exercise of the Put Option, also at a price of CDN$0.35 per share, in the event the transaction contemplated by the share purchase agreement entered into by Turquoise Hill with NUR is not completed by April 30, 2015 (the TRQ-NUR Long Stop Date) (or such later outside date as may be extended by Turquoise Hill and NUR but no later than September 30, 2015 for the purposes of Turquoise Hill's purchase agreement with NSI). DALANZADGAD, Mongolia, April 22 (Reuters) - Rio Tinto committed on Wednesday to spending $5 million a year to help resolve conflicts with nomadic herders and water problems that have stoked political opposition to the expansion of a huge copper mine in Mongolia's South Gobi desert. The 30-year agreement, signed with the province of South Gobi and local towns, is a strong sign the company remains committed to the next stage of the Oyu Tolgoi project, put on hold nearly two years ago amid disputes with the government. "It's a longer life issue," said Oyu Tolgoi Chief Executive Andrew Woodley. "That means you set up long-term plans, and that's what this cooperation agreement is about." Disputes with the government over tax and construction costs and long-running nationalistic concerns have prevented the construction of an underground mine that Rio says will unlock 80 percent of the copper wealth at the project. Rio owns 66 percent of the mine indirectly through its Turquoise Hill Resources subsidiary and the government has the other 34 percent. The first, open-cut phase of the mine is already in operation. Turquoise Hill reported $1.6 billion in revenue for 2014 from the sale of 733,700 tonnes of concentrate from the mine. The cooperation deal fulfils one of the requirements of Rio Tinto's Oyu Tolgoi investment agreement (Mogi: how's it goodwill if it was a contractual obligation), signed in 2009, and could help address concerns raised by Mongolian politicians and environmentalists that the project was failing to help the local community, damaging herding patterns and wasting water. Rio Tinto, operator of the mine, defended the offer of an annual fixed sum of $5 million, with distributions to start this year, as a practical move. "It's difficult to fix something to profitability because what you find is that in years when the company is losing money the contributions would dry up," Woodley told reporters after the signing of the agreement in Dalanzadgad, 220 km (138 miles) from the mine. A recent poll by the Sant Maral Foundation found that two of the three most popular politicians in Mongolia were strong critics of Oyu Tolgoi. One local opponent, Sukhgerel Dugersuren, has said plans to resettle herders whose grazing areas had been taken by the mine failed to account for all the herders who were affected over a wider area and that there should have been more consultation. TRQ closed -2.01% to Tuesday US$3.91, RIO -2.23% to 2,812p. April 21 (Reuters) - Mongolia has extended its cooperation with a World Bank insurer, overcoming another obstacle ahead of a $5.4 billion (3.87 billion pounds) expansion project to its largest mine, the Oyu Tolgoi copper deposit. Disputes with Oyu Tolgoi's lead developer, Rio Tinto (RIO.AX), have prevented the construction of an underground mine that Rio says will unlock 80 percent of the copper wealth. The Multilateral Investment Guarantee Agency Mongolia (MIGA) said on Monday Mongolia had extended its cooperation with it from April 18. MIGA provides insurance from political risk to investors such as those who would finance the underground mine at Oyu Tolgoi. "It's our understanding that signing the current MIGA agreement is an essential precondition to project financing," said Nick Cousyn, chief operating officer at the Ulan Bator-based brokerage BDSec, in an email. Rio chief Sam Walsh, while in Mongolia in March, said Rio would have to return to investors to negotiate a financing deal for the underground mine. Oyu Tolgoi last year missed a deadline to resolve disputes with the government for $4 billion in project financing package from banks. Rio owns 66 percent of the mine indirectly through its Turquoise Hill Resources unit. The remaining 34 percent belongs to the government. Mongolia's prime minister, Chimed Saikhanbileg, came to office in November hopeful of reversing the Mongolian economy's downward trend. The expansion of mining projects such as Oyu Tolgoi and the Tavan Tolgoi coal mine is central to his plan. The International Monetary Foundation has projected 4.4 percent growth for Mongolia this year, without more foreign investment. That compares with 7.8 percent in 2014 and peak growth of 17.3 percent in 2011. "This is another major issue solved by PM Saikhanbileg's administration, which dates back to when underground construction was halted in July 2013," Cousyn said. MIGA's announcement came the same day that government-appointed Oyu Tolgoi board member Ganzorig Temuulen unexpectedly announced his resignation. He was appointed deputy minister of mining in the new government in December. Analysts and officials cited Temuulen as telling Mongolian media that he had criticised the progress the government made in its relations with Rio because it would not lead to a deal beneficial enough to Mongolia and violated Mongolian laws. Dale Choi, the head of Independent Mongolian Metals & Mining Research, said Temuulen's resignation could lead to "a united credible position of the Mongolian negotiations side". April 21 (Bloomberg) -- Temuulen Ganzorig resigned from his position as a director of Oyu Tolgoi LLC, according to an e-mailed statement from the state-owned company that owns Mongolia's share of the Rio Tinto Group operated copper and gold mine. * Resignation was accepted because by law Temuulen is no longer able to serve on company boards due to his current role of Deputy Minister of Mining, a politically appointed position, Erdenes Mongol LLC says. * NOTE: Erdenes Mongol LLC is the state-owned corporation that owns 100% of Erdenes Oyu Tolgoi LLC, a 34% owner of Oyu Tolgoi LLC. 21 April -- As announced on 12 February 2015, Rio Tinto is conducting a US$2 billion share buy-back programme, of which c$1.575 billion is expected to be completed through the on-market purchase of Rio Tinto plc shares. The overall programme is expected to be fully executed by 31 December 2015. Any Rio Tinto plc shares that Rio Tinto buys back between 22 April 2015 and 30 June 2015 inclusive will be handled by an independent third party. This party will make its trading decisions in relation to Rio Tinto's securities independently of, and uninfluenced by, Rio Tinto. Any shares so purchased will be cancelled. This buy-back programme may be suspended at any time. Any purchases of shares will be effected within certain pre-set parameters, and in accordance with both Rio Tinto's general authority to repurchase shares given in general meeting and Chapter 12 of the UK Listing Authority's Listing Rules which requires that the maximum price paid be limited to be no more than 5 per cent above the average market value for the shares as derived from the London Stock Exchange Daily Official List for the five business days immediately prior to such purchase. Rio Tinto confirms that it currently has no unpublished price sensitive information. April 21 (news.mn) There are many expectations in Mongolia about when the Tavan Tolgoi project will be introduced by the Government of Mongolia for the approval by the Parliament. It is widely believed that the Tavan Tolgoi project will be reviewed by Parliament this week. According to sources, last Friday the Government of Mongolia presented a complete set of documents to be introduced to Parliament. Minister of Mongolia, M.Enkhsaikhan said, "If this issue is discussed by Parliament, we need to think about the companies registered on the Tokyo, Shanghai, and Hong Kong stock markets. "In order to protect the rights of shareholders of these companies, it is improper to disclose any agreement which is not signed. This is a requirement of the stock exchange markets." Minister M. Enkhsaikhan added, "We believe that Members of Parliament, as politicians, will be very careful." We spoke to the Advisor to the Prime Minister, Ts.Munkhtur, regarding the introduction of the Tavan Tolgoi project agreement to Parliament. -Could you tell us whether the Tavan Tolgoi project is being officially presented to Parliament? -The answer is yes. We have officially presented the Tavan Togloi project agreement to the Parliament. The documents are now being legislated. Also, we have decided on the issue of registration of shares in Tavan Tolgoi for Mongolian citizens and the certification of these shares. -Will the Oyu Tolgoi credence agreement be concluded? -This is a highly confidential issue and it is being discussed during closed sessions, so I cannot answer that question. -The Prime Minister of Mongolia didn't make a statement on Friday about these two issues being related. -The Prime Minister's health is not so good, so he didn't make a statement on that day. Ulaanbaatar, April 21 (MONTSAME) At the Stock Exchange trades on Tuesday, a total of 236 thousand and 233 units of 24 JSCs were traded costing MNT 20 billion 221 million 198 thousand and 934.00. 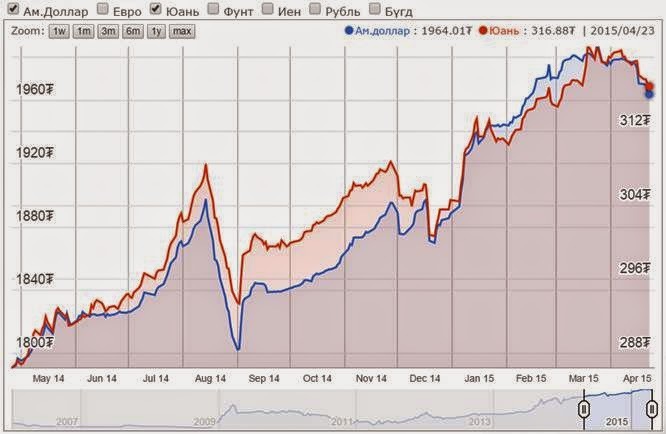 "Remikon" /13 thousand and 076 units/, "Hermes center" /11 thousand units/, "APU" /1,375 units/, "State Department Store" /447 units/ and "Arig gal" /233 units/ were the most actively traded in terms of trading volume, in terms of trading value were "APU" (MNT four million 874 thousand and 250), "Darkhan nekhii" (MNT one million 562 thousand and 400), "Hermes center" (MNT one million 430 thousand and 020), "Remikon" (MNT 980 thousand and 700), "UB-BUK" (MNT 801 thousand and 500). The total market capitalization was set at MNT one trillion 288 billion 275 million 291 thousand and 528. The Index of Top-20 JSCs was 12,858.87, decreasing 1.67% and the all index of MSE was 943.87, decreasing 1.00% against the previous day. Ulaanbaatar, April 22 (MONTSAME) At the Stock Exchange trades on Wednesday, a total of 40 thousand and 736 units of 19 JSCs were traded costing MNT 15 million 594 thousand and 781.00. "Merex" /22 thousand and 726 units/, "Remikon" /14 thousand and 166 units/, "APU" /2,277 units/, "Genco tour bureau" /398 units/ and "Khokh gan" /284 units/ were the most actively traded in terms of trading volume, in terms of trading value were "APU" (MNT eight million 069 thousand and 300), "Merex" (MNT two million 045 thousand and 340), "Gobi" (MNT one million 125 thousand and 180), "Remikon" (MNT one million 062 thousand and 525), "UB-BUK" (MNT 875 thousand). The total market capitalization was set at MNT one trillion 284 billion 738 million 749 thousand and 631. The Index of Top-20 JSCs was 12,786.15, decreasing 0.57% and the all index of MSE was 940.49, decreasing 0.36% against the previous day. Ulaanbaatar, April 23 (MONTSAME) At the Stock Exchange trades on Thursday, a total of 11 thousand and 605 units of 29 JSCs were traded costing MNT 12 million 727 thousand and 983.00. "Hermes center" /5,000 units/, "APU" /1,327 units/, "Moninjbar" /1,140 units/, "State Department Store" /897 units/ and "Merex" /284 units/ were the most actively traded in terms of trading volume, in terms of trading value were "APU" (MNT four million 665 thousand and 550), "Gobi" (MNT one million and 342 thousand), "Mongoliin gegee" (MNT one million and 300 thousand), "Material impex" (MNT one million 200 thousand and 100), "Darkhan nekhii" (MNT 850 thousand). The total market capitalization was set at MNT one trillion 279 billion 332 million 790 thousand and 910. The Index of Top-20 JSCs was 12,803.79, increasing 0.14% and the all index of MSE was 940.73, increasing 0.03% against the previous day. April 21 (Bank of Mongolia) On 21 April 2015, 12 weeks Government retail bonds worth MNT20,904,900,000.00 with 14.988% annual interest rate traded successfully on primary market at Mongolian Stock Exchange. April 21 (MSE) Dear investors, please be advised that the following government bond is about to mature. 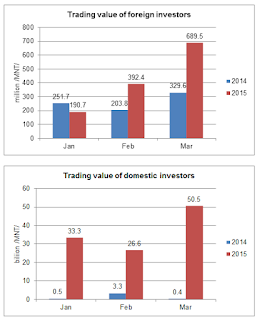 April 22 (MSE) The trading participation of domestic and international investors have been increased by 20 times more than same period of the previous year and reached to MNT117.7 billion in first quarter of 2015. 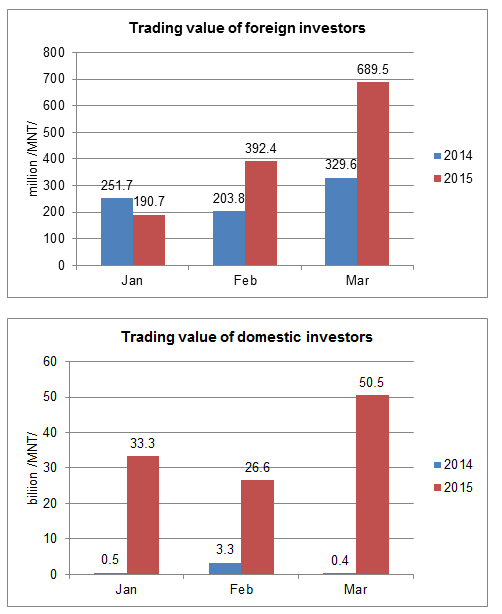 The main reason for increasing investor's participation was the Mongolian Stock Exchange has been organizing primary market trading of Government securities from November 2014, and the secondary market trading from January of 2015. In addition, MSE introduced the "Market Makers" structure into market and as a result, securities' liquidity and investors' interest to invest in have been increasing continuously. 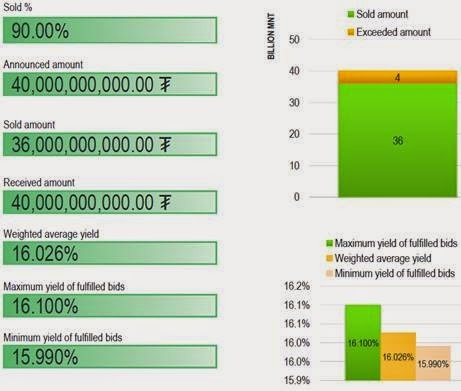 April 21 (Bank of Mongolia) On the Foreign Exchange Auction held on April 21th, 2015 the BOM has received selling bid offers of USD 5.0 million between the rates of MNT 1969.00-1972.00 and CNY 10.5 million in a rate of MNT 316.50-317.00. BOM has not accepted the offer. On April 21th, 2015, The BOM has received USD Swap agreement bid offer equivalent to USD 70.0 million, MNT swap agreement of USD 22.0 million from local commercial banks and accepted the offer. April 23 (Bank of Mongolia) On the Foreign Exchange Auction held on April 23th, 2015 the BOM has received bid offers of USD 4.5 million in a rate between MNT 1964.00-1970.00 and CNY 3.0 million in a rate with MNT 315 from local commercial banks. BOM has not accepted the offer. On April 23th, 2015, The BOM has received USD Swap agreement bid offer equivalent to USD 7.0 million, MNT swap agreement of USD 18.0 million from local commercial banks and accepted the offers. April 22 (Bloomberg) -- Mongolia's 10b tugrik ($5.1m) 5-year govt bond auction Wednesday failed to attract any competitive or non-competitive bids, according to central bank statement. April 22 (Bank of Mongolia) Auction for 52 weeks maturity Government Treasury bill was announced at face value of 40.0 billion MNT. Face value of 36.0 billion /out of 40.0 billion bid/ Government Treasury bill was sold at discounted price and with weighted average yield of 16.026%. Ulaanbaatar, April 22 (MONTSAME) The cabinet of Ministers decided at its regular session on Monday to issue a resolution concerning the Government's purchase of citizens' shares in "Erdenes Tavan Tolgoi" JSC. The resolution is to consider the trade a large-scale transaction, as the total preliminary value of the trade will amount to more than 25 percent of balanced asset of the "Erdenes Tavan Tolgoi" according to its financial report issued March 31. 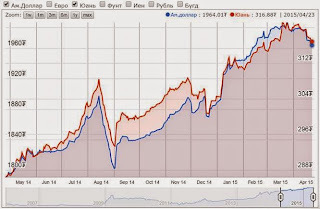 The government resolution No 201 issued in 2012 regulates that a citizen of Mongolia can sell his/her own stock in the "Erdenes Tavan Tolgoi" to the government at a designated face value, in accordance with which a total of 1,503,984 people submitted their requests to sell their stocks--one billion 583 million 628 thousand and 456. However, the Government has not paid for these shares. The citizens have submitted petitions to re-own their stocks. On this April 20, the cabinet assigned the Mongolian Securities Clearing house and Central Depository to manage the processes of re-issuing the ownerships over the stocks. April 21 (news.mn) The Speaker of Parliament, Z.Enkhbold, received Deputy Director of the National Anti Corruption Center Ts.Nyamdorj to discuss several cases involving the National Anti Corruption Center for the direct repression and detention of people. The Speaker pointed out that the National Anti Corruption Center is using Article 68 of the Law of Criminal Procedure instead of using clauses 65 and 67 when detaining people in cases under investigation. According to Clauses 65 and 67 it is possible to use asset pledges or guarantees instead of detention, and the Speaker reminded Ts.Nyamdorj that there are legal actions stipulating external investigations. The Speaker said that there is a need to implement newly approved laws and to end the unlawful method of detaining people, and to pursue new approaches to carrying out the law. April 21 (infomongolia.com) The regular Cabinet meeting took place on April 20, 2015, where one of the issues resolved was to allocate an additional loan of 100 billion MNT (Tugrug) to cashmere processing plants. The decision is purposed to support and export increases of Mongolia's cashmere products and Minister of Industry D.Erdenebat is entrusted to take necessary measures. Mongolian industries usually prepare 3,000 tons of row cashmere annually and by allocating these current assets, it is estimated to prepare 1,670 tons of row cashmere by manufacturing 864 tons of combed-cashmere, of which to export goods worth of 77.5 million USD or 154 billion MNT and to earn 54 billion MNT. In 2014, Mongolia prepared about 7,000 tons of cashmere collected from 19.2 million heads of goat that provides 40% of total demand in the world, whereas 50% is comprised from China and the rest 10% from other suppliers. As of today, over 130 entities of various capacities in cashmere industry of Mongolia manufacture cashmere worth of 700 billion MNT, whereas 600 billion MNT for export, but 85% of totals is being exported as washed and combed cashmere. Therefore, officials deem if to process raw cashmere locally at 100%, it would generate up to 2 trillion MNT. Ulaanbaatar, April 22 (MONTSAME) The Hall of Lawyers at the State House Wednesday hosted a discussion of a bill on formulating and submitting draft laws and resolutions and on rules of implementing them. The discussion was co-organized by the parliamentary Standing committee on justice and the Union of Mongolian Lawyers (UML) with a support from a project called "Backing the legislation actions with civil participation", co-implemented by the Parliamentary Office and the UNDP. A head of the Standing committee D.Ganbat made the opening remarks, saying that their committee and the parliamentary session had already backed this bill, and that a working group, led by Ts.Nyamdorj MP, has been set up to prepare it for the first discussion. He also emphasized that the draft aims to regulate relations in drawing up draft laws and resolutions, to propagandize adopted laws, to manage and control an implementation of laws. He was followed by B.Boldbaatar, the secretary-general of the Parliamentary Office and director of the above project. "People criticize that many laws, adopted by parliament, have not been realized properly, their implementation is rather poor because the laws generally did not reflect the public views. This has been considered and reflected in the bill," he said. Other speeches were given by Ts.Uugangerel, the Vice Minister of Justice, and by D.Batsukh, the UML's president. A "Process of drawing up draft laws and resolutions, submitting and adopting them" report was sounded by B.Baasandorj, chief adviser to the Standing committee on justice. Foreign Minister tours Erdenet Mining Corp.
Ulaanbaatar, April 21 (MONTSAME) Delegates headed by Mr L.Purevsuren, the Foreign Minister, got au fait with activities of the Erdenet Mining Corporation (EMC) last weekend. The group had G.Ganbold, a director of the Department of Multilateral Cooperation; B.Chuluunkhuu, a director of the Department Europe; S.Sukhbold, a director of the Public Administration and Management Department; and members of the "Young diplomats" club at the Ministry. They legged the EMC's office, the "Erdmin" factory, a metallurgical factory, and the "Beren" Group. Purevsuren said the Ministry wants to enhance young diplomats' knowledge on economics, which is needed in frames of a program on enriching the foreign policy with economic contents. The EMC overfulfilled the revenue plan by MNT 200 billion or 18% in 2014, and paid tax of MNT 462 billion to the state and local budgets. April 23 (news.mn) Two years ago special machines providing state services were introduced, and starting from today, people will now be able to access state services online from any location with the launch of ezasag.mn. Ts.Jadambaa, who is responsible for the new website, announced, "Starting from today, people are able to receive state services via the Internet using tablets, laptops, and smart cellular phones." Authorization and passwords required to access online state services on ezasag.mn can be acquired from the state service machines already available to the public. Ts.Jadambaa stressed that the online services are free, and over the next two years 167 state services will be available online. As reported by the Media, Information, and Public Relations Department of the Government, people can now access information and services through ezasag.mn for driver's licenses, vehicles and transportation, social insurance, and social welfare services. April 23 (infomongolia.com) Today morning on April 23, 2015, President of Mongolia Ts.Elbegdorj headed for Eastern three Aimags of Mongolia, Dornod, Khentii and Sukhbaatar, to get acquainted with current alarming situation on the site of the wildfire broke in those areas. During his working visit, President will be meeting with local authorities on stimulating measures to stop and prevent field and forest fires. Currently, a wide range campaign is being organized by public organs and NGOs delivering more forces and equipment as well as clothes, Gers and fire extinguishers. Ulaanbaatar, April 23 (MONTSAME) S.Demberel MP presented a draft law on taxation, which he initiated and developed, to the Prime Minister Ch.Saikhanbileg on April 22. "If approved, this bill will significantly help our business people," he said. It is common in many countries when a cabinet of Ministers submit bills regarding the taxation and budget, "we should put into life a practice when MPs submit such kind of drafts to legislation body through the government," he noted. Parliament has not discussed any of the submitted bills on the taxation for more than a year now, "the cabinet should submit this draft to parliament's reading. If adopted, the law will help establish a favorable tax environment for businessmen and taxpayers," the MP stressed. In response, the PM thanked Mr Demberel for introducing a new practice in Mongolian parliament and promised that his cabinet will reflect the recommendations of the MP, who has abundance of knowledge and experience in business and tax spheres, to the draft general law on tax. Ulaanbaatar, April 23 (MONTSAME) At the "Hour of Minister" weekly meeting on Thursday, the Minister of Justice D.Dorligjav gave a report on some draft laws which are being drawn up in frames of the legal reforms. The Ministry is about to work out fundamentals laws for the legal reforms such as drafts of the criminal law, the law on conflicts and on criminal procedure, and to have them discussed by parliament, the Minister said. Parliament is considering a bill on formulating and submitting draft laws and resolutions and on rules of implementing them, he added. In conjunction with the working out of the draft laws, the relevant laws on Takhar service(law enforcement or Marshal service), on performing court decisions and on police service will be amended, Dorligjav said. Within directions of maximizing the national economic growth and forming favorable conditions for business, drafts laws on the pledge of movable and non-material properties, on promoting the economic transparency, on economic amnesty, on the right of owning capitals and on state registration of properties have been passed to parliament, the Minister said. The Ministry also intends to draft new wording of the laws on performing court decisions, on fund for recovering loss, on prosecutor bodies, on legal status of lawyers; draft amendments to the laws on homeland force, on investigation service and on frontiers, Dorligjav said. Ulaanbaatar, April 22 (MONTSAME) A parliamentary Standing committee on environment, food and agriculture held a first reading of the draft parliament resolution on adopting the state policy on forests and resolved to submit the approved recommendations from the members on April 22. S.Oyun MP said the main objectives of this policy will lie in preserving a balance of eco-system, stopping the forests degradation, forests rehabilitation, extending the forested areas through organizing tree-planting campaigns, and in establishing a sustainable forest management that aims at appropriate and stable use of forest reserves. The committee members asked a working group about the expected results from the adoption of the policy document, if there are any regulations that set out the areas where dead trees can be collected and about a quota of trees to be logged, that concern the measures to be taken in cases of the forest fires coming from outside the borders. They recommended coordinating the policy with mining activities and charging illegal loggers with direct arrest and imposing appropriate amount of fine rather than just seizing their trucks, and including them in tree-planting works. A working group was set up at this meeting to prepare the submitted to parliament documents for their readings, including draft amendments to the Law on Forests, draft amendments to the Law on Environment Protection, to the Law on Government's special fund, and to the Criminal Law. The group will be led by J.Batzandan MP. April 22 (gogo.mn) The Minister of Construction and Urban Development D.Tsogtbaatar, who is participating at the "World Cadastre Summit" by the invitation of Turkish Government, met with İdris Güllüce, Minister of Environment and Urban Planning on April 21 and discussed on cooperation in construction and urban planning sector between two countries. The Minister of Construction and Urban Development D.Tsogtbaatar requested to provide financial and other support on introducing modern and advanced technologies, make investments from Turkish investors, implement and study Turkish experience to introduce European standards in Mongolian construction industry and ensure safety. Mr. İdris Güllüce briefly mentioned the accomplishment of construction sector in Turkey and expressed his willingness to cooperate on implementing their experience and technology to Mongolia. The Minister of Construction and Urban Planning D.Tsogtbaatar invited Mr. İdris Güllüce to pay visit to Mongolia in the nearest future. Ambassador Extraordinary and Plenipotentiary to Turkey B.Batkhishig and General Consulate E.Munkh-Ochir attended in the meeting. April 21 (news.mn) Today is the birthday of the Leader of the democratic movement, meritorious person of the state S.Zorig. Honoring S.Zorig, the Civil Will Green Party has placed flowers in memory of the young leader on his memorial statue. In the opinion of the Civil Will Party, although almost 17 years have passed since the murder of S.Zorig, the case is still unsolved. The party believes that those holding power now should report to the nation what has been done to find and punish his murderers. The party feels that due to the loose principles in politics of putting personal interests first, politics in Mongolia, society, and the economy are facing very difficult circumstances. The Civil Will Green Party has appealed to all parties to adhere to the principle of putting the interests of the nation first. Ulaanbaatar, April 23 (MONTSAME) A member of parliament J.Batzandan Wednesday met with inhabitants of the 13th khoroo (smallest administrative unit in UB) of Bayanzurkh district to hear problems they face in a process of re-planning ger (national dwelling) areas. He has been selected a leader of a working group at the Standing committee on petitions with responsibilities for formulating a draft decision and proposal on improving conditions of the ger areas. The "Tsagaankhuaran consulting" company has won a bid to construct apartments in this khoroo, but even a lands freeing has not started due to arguments between the residents and the company. The people say their lands have been valued too low, while the company tells that proper agreements were made when 75 percent of the families had concurred to set the lands free, "they must obey the agreement". The residents insist that an audit commission must examine whether the bilateral contract had reached 75% for the agreement, and that the selection process must be done with their participation, moreover, their lands' prices must be added. At the meeting, the people got some answers from Sh.Gankhuyag, a head of the City's Department for Ger Area Development, and P.Ganzorig, a director of the "Tsagaankhuaran consulting" company. The MP promised to pay attention to the problem. April 23 (UB Post) The following is an interview with the first President of Mongolia, P.Ochirbat, who is currently working as a member of the Constitutional Court of Mongolia. The interview covers two main topics, the Constitution of Mongolia and Tavan Tolgoi (TT). Lately, everybody is talking about making changes to the Constitution. Does the Constitution, adopted in 1992, require amendments? Mongolia's Constitution is a law visioning to the far future and is able to be effective for a very long time. Time isn't specified for the Constitution. For example, principles prioritizing human rights were included in the 1992's Constitution. Human right is an eternal topic, right? There's no such thing as protecting human rights for some time and then stopping. Similar to this, a mixed economy was established by tying it with human rights. Overall, a free property system was made; there's government property and private property. Property becomes a guarantee for exercising a person's full rights. Having property reduces dependency on others. Moreover, the Constitution provided government structure and management. It eliminated the dominance of one party rule and formed a multi-party system. This is a principle to be complied with forever. Before, freely expressing one's views and pluralistic views was limited when Mongolia was under the dominance of one party rule for 70 years during Socialism. It wasn't exactly a closed system, but limited. This was changed, becoming a long-term principle. The Constitution straightened out many issues so it should stay effective for a very long time. Don't you think that the interrelationship between governance and control has been lost? Parliament seems much bigger than the government. Aren't politicians demanding to change the Constitution because of this? The Constitution approved in 1992 had removed all potential opportunities for this conflict. Particularly, it stated that an MP can't have a dual position or job other than his role as an MP. The amendment made in 2000 made this possible. This triggered MPs to have two faces: one as an MP who approves legislation and another as a member of the executive governance that implements decisions of Parliament. Conflict will surface if one person carries out both roles. Not to mention, the change made in the Constitution in 2000, which decreased the attendance of parliament sessions, has made it possible to have 20 people approve legislations. If 18 of the 20 MPs work as a member of the government dually, the other two members can be easily lobbied and turned into allies. So legislators have almost become the executive governance. It's like MPs are passing laws that they submitted. MPs have brought this idiocy upon themselves. Now, they're saying that the government is overreaching their power and not obeying their orders. This sort of thing wasn't permitted in the 1992 Constitution. Government organizations are specified in the Constitution to report their work to Parliament. But now that they have dual positions as an MP and minister, to whom would they report to? There is no control or monitoring because of this. MPs broke the control system and now they're putting the blame on the Constitution. You've been involved in the Mongolian politics for the last 25 years. In the past, there've been only two governments that exercised their rights for the entire four year term. Why do you think that governments are collapsing before their appointed time and what's causing political instability? This issue is totally irrelevant to the Constitution. The Constitution didn't cause this issue. It was caused by the formation of parties. In the last 25 years, the government changed 14 times. In only two cases, the government itself initiated to resignation. The first resignation incident was by the government led by Prime Minister D.Byambasuren. D.Byambasuren submitted a proposal to the Baga Khural, asking whether Parliament trusted his government. In response, the President determined that there wasn't any basis for not entrusting his government and that the government should continue operating. I was that President. The Baga Khural concluded after discussions that the government was exercising its rights correctly and consistently with the Constitution, and didn't dismiss the government. In the end, eight members of that government resigned and the government was dismissed. Other governments resigned with initiations from core political parties. This is connected to the competition for power between parties. In fact, a conclusion must be made by the Constitutional Court before dismissing a Prime Minister or government. But not a single person had the Constitutional Court make a conclusion. This means that governments are being dismissed at the initiations of groups MPs, violating the principles in the Constitution. Government resignations were caused by competitions between parties, not because the Constitution is faulty or poorly developed. People are cautious of parties attempting to change the Constitution for their own benefit. Can you comment on this? The law specifies which provisions can be change and which cannot. So I'm not anxious about the potential of major changes to the Constitution. In general, it's fine to make some amendments and changes to the Constitution as long as national interests are considered higher than interests of parties. There's something I'd like to add. I believe that it's wrong that officials managing the Mongolian government have dual positions as MPs and ministers. For example, there's Speaker of Parliament and Head of Democratic Party (DP) Z.Enkhbold. In 1990, he criticized Yu.Tsedenbal and J.Batmunkh for taking up all positions onto themselves. How are you different from them now, Z.Enkhbold? You're the Speaker of Parliament and Head of the DP. You're exactly the same as J.Batmunkh. You demanded his resignation in 1990. Now you've become exactly the same as him. Also, party heads shouldn't be Prime Ministers. We've experienced this during Socialism when Yu.Tsedenbal served as Prime Minister and General Secretary of the Mongolian People's Party. The DP criticized him for holding all powers to himself. Now, the DP's holding power over both government and parties. This isn't advancing Mongolia to anywhere. Parliament is the highest legislative authority so why are MPs interfering in government work? The constitution states that the government will lead the development of the society and economy. When the government is supposed to manage this, why are legislators interfering in issues such as TT? TT is an economic issue. In other words, it's the government's work. This brings us to the next topic. Are you involved with TT? Do you own TT shares? No, I don't have shares. The only thing I have is the 1,072 shares all three million people of Mongolia are said to own. They say that everyone, including me, you, Ts.Elbegdorj and even Z.Enkhbold, have shares, but it's a lie. There's no proof or guarantee. Isn't it registered in the Securities Clearing House and Central Depository? Who cares if it's there? We don't have shareholder perks. Money was probably only given to the group of people who said they'd rather have their million MNT in cash. If shares are being distributed, I want to get shares of all natural resources from Erdenet, Oyu Tolgoi (OT), Baganuur and Shivee-Ovoo deposits. Why are we allowed to get shares from only TT? Let's all get shares from other companies. Nevertheless, this is a deceit by officials. What do you mean by deceit? If the state has promised to distribute shares to the public, a single production shouldn't be responsible for the job. Production will pay taxes, royalties, fees and whatever it needs to pay to the state. In return, the state must give stock dividends to the public. The state shouldn't be assigning all tasks to a producers. This is the state's matter, not the producers'. Honestly, distribution of shares was just a "show" for elections. OT was ruined by election shows, now TT will be ruined. One party promised a million MNT and another raised it by 1.5 million MNT, totaling it to 2.5 million MNT. Later, 250 million USD was lent from OT and 350 million MNT from Chalco, and distributed it to fulfill that promise. Then, it was promised again that the money will be distributed as shares. When politicians encourage the public to invest in TT, people are telling politicians to first repay the debt of the Chalco deal. It wouldn't be wrong to ask politicians why the public has to repay election show debt on their behalf. It seems that Mongolia finally found a way to have the debt repaid after losing face. What would you recommend as the next step? In any case, TT and OT mustn't be delayed any further. The other [contract] party wouldn't have counter attacked if Mongolia hadn't made various conditions. The feasibility study has been received. Deep underground mining should be started at OT after inspecting the feasibility study. Or else, Mongolia will see many bad consequences. As for TT, Parliament will discuss it, although it's not Parliament's job. The government should've established investment agreements and settled the issue. In fact, losing time by taking this issue to Parliament isn't beneficial to Mongolia. Unless OT and TT are quickly mobilized, Mongolia's economy will collapse. One of them will bring danger to the USD exchange rate, which is nearing 2,000 MNT. Mongolia's economy is fragile. However, it's quite good at recovering. To recover the economy, these two deposits must be mobilized. April 21 (UB Post) The Sant Maral Foundation (SMF) has released its results of their latest survey on approval rates of politicians of Mongolia. The foundation underlined that the survey, named the Barometer of Politicians, involved 1,200 people from Ulaanbaatar, as well as Khentii, Uvs, Tuv, Uvurkhangai, Arkhangai, and Dundgovi Provinces. The survey was conducted from March 27 to April 12 this year. The SMF is a public benefit, self-governing, non-profit non-government organization. The foundation conducts wide range of opinion polls and research studies on political, economic, and social issues to provide unbiased and reliable information on changes occurring during transitional times of Mongolian society. Mongolians focus on two points of political surveys. The first pointer is the approval rating of politicians, and second is the ratings of political parties. In the graph below, you will see how people answered the question, "Out of reputable politicians in Mongolia, who do you want to have more impactful participation and play an important role in politics?" MP S.Ganbaatar was voted as the most approved politician with nearly double the amount of votes compared to the runner up – former President and Head of the Mongolian People's Revolutionary Party (MPRP) N.Enkhbayar. This was unexpected as S.Ganbaatar had been receiving various criticisms on social media due to his photo shoveling out his car out of heavy snowfall. Some of the comments on the photo read, "MP S.Ganbaatar is doing his usual populism," and "With elections drawing closer, populist members are trying to appeal to the public." Former President N.Enkhbayar's approval rate was almost nine percentage points more than the current President of Mongolia Ts.Elbegdorj's approval rate in the SMF poll. N.Enkhbayar, who is reportedly being treated in South Korea, was voted as the second most approved Mongolian politician, after MP S.Ganbaatar. President Ts.Elbegdorj was ranked fifth. N.Enkhbayar's reputation hasn't yet died out despite his restricted participation in politics. Political observers noted that the outcomes of the poll may explain why the current government rulers had been so afraid and hasty to limit the involvement of Head of the MPRP N.Enkhbayar in political activities. Furthermore, representatives of the current ruling party, the Democratic Party (DP), did not make it to the top 10 politicians, namely Speaker of Parliament Z.Enkhbold and Prime MInister Ch.Saikhanbileg. The public was also asked to answer which political party they would vote for "if an election was conducted tomorrow". According to the results, 38.9 percent of survey takers voted for the Mongolian People's Party (MPP), 33 percent for the DP, 18.9 percent for the MPRP, 4.4 percent for the Civil Will Green Party, 1.7 percent for the Mongolian National Democratic Party, and 3.2 percent voted for other parties. The MPP wasn't able to outrank the the DP in recent years, but the latest survey of the SMF displayed a different outlook. Particularly, the MPP outpaced the DP with a gap of 5.9 percentage points. The outcome of the poll also showed how influential the ratings of party members are in the ratings of a political party as a whole. N.Enkhbayar's high rating has boosted the rating of the MPRP, according to the SMF. If there's an election tomorrow, which party will you vote for? April 21 (AFP) Chanting prayers to Tenger, the all-knowing holy sky, Mongolian shamans in fur and feather headdresses protested against a Canadian mining project they say threatens ancient grave sites. "It's for our love for Mongolia, to protect our resources and territory," said Tseyen-Oidoviin Sarantuya, who travelled more than 1,000 kilometres (620 miles) to demonstrate in Ulan Bator's main square against the venture. "I want people to know that Mongolia should remain Mongolian," she said. Beneath Mongolia's expansive, largely empty steppes lie coal, copper, gold, iron ore and other minerals whose worth is estimated at more than $1 trillion -- wealth that could transform the lives of its three million inhabitants. But efforts to extract it have tottered in the face of incessant internal fighting over how much control and profit foreign companies should be allowed, and deep-rooted suspicions of outsiders. Around the world, naturally endowed countries have failed to fully realise and distribute the benefits of their bounties and Gantumuriin Uyanga, a member of the Great Hural parliament, told AFP: "Mongolia already faces the resource curse. It is reality now." Her Mongolian National Democratic Party is part of the ruling coalition, but she said spiritual appeals illustrated authorities' failure to spread the wealth. "It seems to me truly unfortunate that people are asking help from the sky because of the poor governance in Mongolia," she said. Just four years ago the country led the world in economic growth at 17.5 percent on the back of a minerals boom exemplified by the vast Oyu Tolgoi copper and gold mine in the Gobi desert, controlled by Anglo-Australian resources giant Rio Tinto. But rising resource nationalism and an increasingly stringent business environment have since dampened investor enthusiasm, while the global commodity bust makes exploiting them less profitable. In 2014 foreign direct investment into the landlocked country plummeted 74 percent, Mongolian central bank data shows, and economic growth dropped to 7.8 percent. The Asian Development Bank forecasts expansion will plunge by more than half this year, to a mere 3.0 percent. Julian Dierkes, an expert on Mongolia at the University of British Columbia, said the country was still finding its way in the capricious world of international finance and was simultaneously "the object of desire and scorn for global capitalism". Now authorities are trying to break the logjam. In February, Mongolia's president pardoned three foreign former mining executives who had been jailed for tax evasion in a case that spooked investors. Earlier this month, Prime Minister Chimediin Saikhanbileg -- who can reportedly bench-press 175 kilograms -- announced the government and Rio Tinto had agreed "in principle" to go ahead with Oyu Tolgoi's stalled second phase, saying that making "historic decisions" was his duty. Sam Walsh, Rio Tinto chief executive, told the company's annual meeting last week that discussions were continuing. Ulan Bator has a national dilemma to contend with. The proud homeland of pan-Asian conqueror Genghis Khan, in more recent centuries Mongolia has frequently been a geopolitical pawn in the power plays of huge neighbours China and Russia, both of which have dominated it in turn. Sodnomiin Tsetsgee, a kindergarten teacher expecting her first child, was among the many who boycotted a controversial text message referendum that backed stalled foreign resources investment ahead of the prime minister's Oyu Tolgoi announcement. "We should use our resources for ourselves," she said. "It's not good that only foreigners benefit from them." Mongolia's nomadic heritage, traditional animistic beliefs and nearly seven decades of communism have given it an enduring sense of the land as common wealth -- private land ownership was only constitutionally recognised after the country's 1990 democratisation. Myagmarjaviin Enkhzaya, vice president of the Institute of Mongol National Shamans, took part in the Ulan Bator protest and says Toronto-based Centerra Gold's plan would harm culturally important graves. The company says the burial sites' locations are known and it will not interfere with them. But Enkhzaya said: "We want people to understand that while you sleep greedy people will be exploiting Mongolian natural resources as well as the mountains we worship. "There will be no land to inherit in future because corrupt politicians are selling it away." At the same time Mongolia's $1.3 trillion in mineral riches are a treasure trove in a country with a gross domestic product of just $12 billion. The result can be conflicting attitudes. Some shamans have turned down lucrative jobs with mining companies out of spiritual concerns, said Amalia Rubin, a researcher at the University of Washington. "There's very much this internal argument between wanting Mongolia to develop and wanting Mongolian people to get the benefits of economic development, with the idea of propitiating the earth spirits and also following traditional Mongolian customs," she said. April 22 (Asia Pacific Memo) Since moving out of the Soviet orbit, Mongolia has experienced tremendous economic and political change as it continues to move towards a free market and democratic governance. This transition, alongside the realization of the country's major mineral deposits, has garnered the interest of international resource development and the support of international finance for aid and development. But managing its vast mineral wealth is fraught with risk. We know today that nations like Mongolia with an abundance of mineral and extractive resources can experience the phenomenon of lesser social development compared to their less resource-rich counterparts (the "resource curse"), or that of excessive demand, a loss of non-resource related business and positive externalities ("Dutch disease"). To address this, since 2004 Mongolia has participated as a compliant member in the Extractive Industry Transparency Initiative (EITI), which brings together a multi-stakeholder working group of civil society, industry and government actors to implement oversee the transparent reporting of extractive company payments to the government. From 2006 the EITI has published an annual report, and works to better its dissemination to civil society in order to promote accountability, especially in mining regions. Today extractive companies are active in one third of Mongolia's 329 soum (counties) and over 1,500 companies participated in the EITI in 2013. The EITI report provides a complex accounting spreadsheet of payments, reconciliation, donations and discrepancies. When EITI reporting was launched in Mongolia mining companies and civil society had little knowledge of or interest in it. However, civil society was quick to recognize its value and has used it in some cases to protect local rights. This said, the reporting remains largely unapproachable to the everyday citizen. Here knowledge translation and communicative practice will be critical in identifying what stakeholders in civil society desire from the report and mobilizing the report into appropriate mediums. While the completion of major mineral developments in Mongolia's Gobi region may bring major financial gains for government and mining companies alike, the development of mineral resources carries the potential to leave one of two legacies: either one of corruption and failed governance, or one of an empowered civil society and comprehensive human development. In Mongolia, the continued successful adaptation of the EITI and its reporting may help ensure the latter. In 2014 we traveled to Mongolia to research the EITI and to produce a short video documenting the state and future of the EITI initiative in Mongolia. In its production, we were exposed to a cross-section of stakeholders, from policy makers, to miners, to families—from the boardrooms of Ulaanbaatar to the heap leach piles of Boroo Gold. Starting from the next memo we will present the video outcome of this project in two parts. Christopher Carter is a MASc candidate in Natural Resources Planning at the School of Community and Regional Planning at UBC his research focuses on multi-stakeholder decision making, regional planning and natural resource policy. His audiovisual and regional planning work can be found on hiswebsite. Dulguun Davaanyam is a MASc. candidate student at the NBK Mining Engineering department at UBC on the Oyu Tolgoi International Scholarship, her current research focuses on tailings metagenomics in mine remediation and environmental sustainability. · Georg Caspary, "Practical steps to help countries overcome the resource curse: The extractive industries transparency initiative," Global Governance 18.2 (2012): 171-184. See our other memos on Mongolia. April 23 (infomongolia.com) The Government of Mongolia in collaboration with Mongolian National Chamber of Commerce and Industry (MNCCI) have jointly organized to bestow Mongolia's Top 100 Enterprises of 2014, which has been organized annually since 2011. The award handing ceremony was held on April 22, 2015, where Prime Minister Ch.Saikhanbileg, Minister of Finance J.Erdenebat, Minister of Industry and other officials were present. In his remarks, Premier Ch.Saikhanbileg underlined, "One of the priority directions of the Government of Mongolia is to improve the business environment, support entities, lead corporate governance into a newer level and to create better legal shape as for employers as workers. Also, we aim to improve investment environment and working together to support activities for both local and foreign partners. In this sense, private sectors despite of its capacities generate up to 70% of GDP and provide about 90% of total employment that play major role in creating the state budget. In 2014, these Top 100 Enterprises accounted 2.5 trillion MNT (Turgrug) or 30 percent of the total state budget". April 20 (Khan Bank) The General Authority for Social Insurance named the top 11 entities and organizations that made valuable contributions to the country's development and fulfilled their legal obligations of providing social insurance to their employees and increasing the number of insurees in the fiscal year of 2014. From over 26,000 entities from nine districts in the capital city and 21 aimags, Khan Bank has been awarded the title of National Top Employer - Best Social Insurance Premium Payer for enrolling all of its employees in social insurance, reporting on time and paying MNT 10.6 billion to the social insurance fund. Top Employers and Best Insurance Premium Payers are selected upon certain criteria including an increase in the number of insured persons, growth of average monthly salary, and contribution to the social insurance fund as well as absence of pending premium payables. Moreover, Khan Bank's headquarters was also named as the Best Insurance Premium Payer of 2014 for its fulfillment of social responsibility and contribution to the performance of the economic and social goals of Bayanzurkh District. In accordance with its nationwide operations, Khan Bank demonstrates its leadership in performing its social responsibility and in providing social guarantees to its employees. Ulaanbaatar, April 21 (MONTSAME) The cabinet meeting on Monday approved a concept of a bill on ratifying a joining of the Asia-Pacific Trade Agreement (APTA), and then obliged D.Erdenebat, the Minister of Industry, to formulate the draft law and to discuss it at the cabinet. - The cabinet discussed draft new versions of the laws on the Constitutional Court and on adjudication procedure in the Constitution, worked out by the President Ts.Elbegdorj. - The cabinet backed a draft amendment to the law on competitions, initiated by S.Demberel MP, and decided to convey some proposals to the draft initiator. The cabinet also backed a matter about getting a right of becoming a partner bank of the Interbank Association at the Shanghai Cooperation Organization (SCO), and obliged the Foreign Minister to report it to the SCO's Secretariat. - The State Property Committee (SPC) was obliged to approve an appendix list of immovable properties at the ownership of basic capitals of state-run institutions to be passed balance to balance. - The cabinet altered the list of international organizations to whom tax is paid from the state budget. This list was approved by the 1st appendix of the governmental resolution of 2007 on taxes and donations to be given to international organizations and trust funds of international contracts and conventions. - The cabinet approved technical objectives as an appendix for the uranium exploitation by sulphuric acid underground, and it will come into force from January of 2016. Ulaanbaatar, April 21 (MONTSAME) The Cabinet resolved on Monday to issue a three-year license for "QSC" LLC for building the base structure of a 23.4-kilometer railroad to connect Tomortei deposit in Khuder soum of Selenge aimag to Khandgait station of Eroo soum. The Minister of Road and Transport N.Tomorkhuu was assigned to transfer the ownership of the railroad base structure upon a termination of the concession agreement with the above company on establishing a Mining and Metallurgy Complex. The completion of the railroad is expected to facilitate the transport of more than three million tons of iron ore per year from Tomortei deposit to Darkhan Iron Plant for producing 1.5 million tons of wet and dry concentrates per annum, and producing other value-added products. These productions will be a support to the development of Mongolia's heavy industry and will promote the rising small and medium enterprises. Ulaanbaatar, April 21 (MONTSAME) The Minister of Mining R.Jigjid reported on Monday to the Cabinet about the activities of the working group in charge of issuing new permits and restoring mining permits. It has been working in frames of the new regulation on the implementation of the amended Law on Prohibiting Mineral Exploration and Extraction Near Water Sources, Protected Areas and Forests and the Government Resolution on Promoting Economic Growth through Intensifying Gold Mining. The group is providing the entities and public organizations with required information and consultations, he said. Last week, 316 license-owners submitted requests to restore their mining permits. Those permits have been effective over 201 mine sites located in water reserves, 13 sites in forests, and 60 sites near water sources. April 23 (gogo.mn) Coal imports of Inner Mongolia have increased, but due to the decline in the commodity prices the amount of sales is declining accordingly. According to the Huh Hot Customs Authorities the coal imports in the first quarter of this year have increased by 34 percent reaching 3.7 million tons. While the commodity prices have seen the decline of about 40 percent the total amount of the imported coal is at USD 135.5 million only. 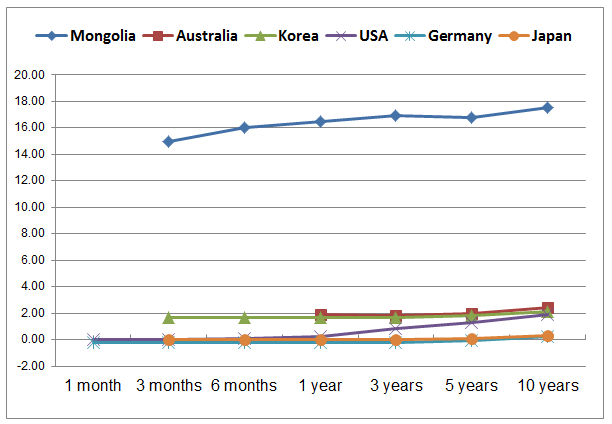 Even though the Inner Mongolia imports the coal only from Mongolia the statistics of the imports at both ends vary. According to the NSO the coal exports in the first quarter of 2015 was at 3.2 million tons having seen the decline by 13.3 percent compared to the same period of the previous year. And the amount of the total coal exports equals to over USD 140 million. Chinese side informs that the coal prices at the two Mongolian ports were stable on a monthly basis. While the annual numbers show the decline in coal prices by 8,3 percent at Gashuunsukhait port and 26 percent at the Shiveekhuren port. Ulaanbaatar, April 22 (MONTSAME) Sausage and tinned meat factory of Makh Impex LLC was handed on April 22 a certificate of ISO9001:2008 quality management system. Present at the ceremony were the vice minister of Food and Agriculture B.Batzorig, the president of the Association of Food Producers D.Terbishdagva, the chairman of the Mongolian National Chamber of Commerce and Industry B.Lkhagvajav, the vice chairman of the Government Agency of Standardization and Measurement D.Sukhbaatar, the executive director of Mongolian Meat Union B.Jadambaa. The Vice Minister B.Batzorig said the introduction by the food-producing companies of international quality management standards meet the vision and the policy of the Ministry, "this is to promote the food sector development, enhance the domestic production, reduce import food dependency, and to ensure the citizens' stable access to healthy, safe and nutritious food". He added that the state pursues a policy to ensure a sustainable development of food sector through improving exports of organic food products, developing logistics' networks and quality management systems, ensuring livestock health and protecting the pastoral and grown plants. In meeting these policy objectives, the contribution of food producers is vital, he noted. ISO9001:2008 has been created by a standardization institute located in Geneva, Switzerland, and helps the companies produce standardized and costumer-satisfying products, in return to help them benefit from these mutually-satisfactory services. Makh Impex has become the first in its field of activity in Mongolia to introduce the quality management system. If the meat industry introduces ISO HACCP quality management system into their operations, Mongolian meat products will become compatible on the global market. April 23 (Mongolian Economy) Mongolian Economy magazine travelled to Berlin in March to cover Mongolia's participation as partner country of the world's largest travel trade show, International Tourism Borse-2015. While reporting from Berlin, we interviewed David Ruetz, exhibition director and head of ITB Berlin at Messe Berlin. He joined the ITB organising team in 2001. Looking at your final report of ITB Berlin, the event set some new records. What are this year's achievements? We are the only trade show in the world that has not only such a high percentage of foreign visitors, which is about at over 75 percent of non-German exhibitors. But we have also the highest percentage of non-German buyers, which has risen this year from 40 to 43 percent. That is a record high. This year we had a report of 115,000 buyers, and 175,000 trade visitors. According to estimates by Messe Berlin, the volume of sales at the world's leading travel trade show increased from around 6.5 billion euros in 2014 to 6.7 billion euros within the five weeks of ITB. That's in business transactions. So we are not only the largest gathering—the united nations of tourism, here—but also the largest business gathering, on one single spot. Of course some do business during the year, when they travel. But the advantage of a trade show is actually three-fold. First, you see things that you didn't plan on seeing. The internet cannot do that for you. Second, in Berlin we have the whole spectrum of tourism in one place. On 170,000 square metres, you can see travel technology, hotel, aviation, spa and wellness destinations—the whole hospitality and tourism sector. An average visitor at ITB walks 14 kilometres per day to do his business appointments. And third, what ITB gives you, is the personal interaction. Of course we all work with the internet, we work with social media, but personal interaction is actually the unique selling point, combined with the other two things that I just mentioned. How does this event affect the German or Berlin economy? I notice that it is quite difficult to find a hotel in Berlin now as they're all full. Actually the hotels in Berlin during these five days, they earn 11 million euros in overnight stays. And of course our visitors spend more. They take taxis, they pay airport fees, they do shopping, they go to restaurants, they do some tours. Actually, at the Messe [Messe Berlin exhibition centre], we secure 25,000 jobs—directly, with all the people working here now. But on a wider scale, Berlin and Germany are profiting from ITB in a range of roughly 300 million euro in wider spending and additional revenue. So that is the reason why in Germany, all of the cities are the owners of the trade show facilities, of the venue, and they also own the shows. So ITB is owned by the Berlin government. This is why we were able to have all of the political influence, and invite the political decision-makers when Mongolia was presenting itself as a partner country, since we are a part of the Berlin government. Why did you choose Mongolia, when there were many other partner countries available to choose from? First is we have worked with the private sector and the government people for a long time to achieve this. I would say at least four or five years we have been working together. For us it's important to have reliable partners, and we found them in Mongolia. Second, we saw the potential of Mongolia in the future. When you have a partner country that's already very developed, of course it's another focus. They might showcase just only their new hotels or whatever because the rest have been known. And people would say, "I know already this destination." But what happened here, what made us so happy, is that the media, especially the international media, all jumped on the fact that they didn't know Mongolia very well. The third reason is that we saw and still see a great potential in Mongolia as an undiscovered destination, where people, especially from the Western cultures, can have digital detox vacations. Do you have any numbers on the amount people who view Mongolia as a travel destination? Yes, actually this weekend before ITB, the German Travel Research Institute published a figure that within one year, from 2014 to 2015, the number of Germans interested in Mongolia and being aware of Mongolia as a travel destination rose to 4.3 percent from nearly zero. That's three million Germans that have said they are aware that Mongolia is a travel destination. Of these, 150,000 Germans have already planned a vacation to Mongolia in 2015, 2016 or 2017. This survey shows that these 150,000 travellers are mainly under the age of 40, which is interesting information for the Mongolian private sector and for their product development, because they would know, okay, our guests are under the age of 40; they are active guests, they are guests that are young. They are multi-interested. They may not rely on luxury hospitality, but they are also social media and internet focus people. That's a marketing aspect that should not be neglected. This information will help the travel industry of Mongolia to shape their products accordingly. What aspects of Mongolia are attractive to younger visitors? Is it that they are young and view Mongolia as a destination for adventure? I think it's different. People under 40 are also someone who's 39, so it's not always youth. This may be a settled business person. But this is a generation, I would like to say, that has travelled the world already. They have seen the world, and what they are looking for is something undiscovered, not mainstream. What they are also looking for is something that is a contrast to their everyday life. That helps them to go away from the stress. They're looking to also meet people from a culture that they would be able to interact with. And I myself, in my travels to Mongolia, have discovered that it doesn't matter where you go in Mongolia, the people are so open—I have travelled Asia very often, to many countries, and this is exceptional. It's not Asia, I don't feel that I am in Asia. The Asian culture is sometimes a little bit kept back, sometimes maybe shy, or a bit closed. But I have found the Mongolians to be very open and often very direct and to the point— which for me as a European is an ideal counterpart, because as Europeans we also like to be direct. So I think there's a nice match when Western travellers travel to Mongolia. It seems many are happy with Mongolia's opening ceremony. What did you think about the ceremony? Is Mongolia using its opportunity as partner country to the full extent that it could? We have worked together with the team of Tourism for Future NGO [Mongolia's ITB organising body] and the other people. The opening ceremony was one of the best I ever saw at ITB. Why was that? Because it was the contrary of what was expected. People expected an Asian performance, something like court dances and music. And it was the contrary. It was a powerful manifestation of self-consciousness of a small country with one of the oldest histories ever. Mongolia also during this opening gala showcased that from Mongolia they have sent talents to the world, by bringing international stars. And I felt this was very appropriate. You see Mongolians everywhere, you find them everywhere, and this influenced 4,000 decision makers during the opening gala. Together with the Mongolian team we created many opportunities for Mongolians to meet people. For the time being, I clearly can say they did the maximum. But I should say that the last day of ITB is not the end, it is meant to be the beginning; the beginning of the momentum that is now taken up to transport that into the next 24 months. That will be the challenge, because ITB will now not be able to babysit—if I can say so—tourism in Mongolia. Babysitting is unfair—but maybe shepherding, guiding. But our role as a guide ends at the last day of ITB. We'll be happy to give advice, but now there needs to be some follow up. Follow up with the contacts that have been made, follow up with the media, follow up with the partners in Mongolia in order to leverage the outcome, transform tourism products. Take this information that we've gathered and say, should we do more social media and rely on the under-40 guests, and so on. That is the challenge that is there for the next 24 months. And I hope that all of the players that have contributed so well—the government, the private sector, the NGOs—that they will sit together and have a debriefing and define a milestone plan for the next 24 months. The excitement seems to be shared by the ITB participants, who are making more contracts than ever with Mongolian tourism companies. Do you have any numbers regarding business deals at ITB-2015? This number constantly rose over the last few years. We started out with EUR 4 billion in business transactions. Last year was EUR 6.5 billion, and this year is EUR 6.7 billion. So, a steady raise. Not every exhibitor will reveal their business figures, because of some confidentiality; but basically, over 80 percent of the visitors expect positive business also after ITB. Now, the challenge is to follow the sales leads that you made here at ITB. Statistics tell us, over and over, that 50 percent of all of the sales leads are not being followed up properly, which is just a waste of money. That should be the first emphasis, and this should be the first question in the debriefing meeting that I mentioned: "Have all the sales leads been followed up appropriately?" It's a question of sustainable impact. It can last for the next 24 months, but it also can last only 6 months. Because now there's a big media hype that we have generated. We have generated through ITB about 570 million media contacts, worldwide, resulting in a media-equivalent value of 30 million euro. That's a gigantic package that you can never buy or afford. But it will be important to maintain this level, and keep the fire burning, so to say. How extensive is ITB's media coverage? We had about 5,180 accredited journalists from 75 countries and some 350 bloggers from 29 countries reporting on events at ITB Berlin. There are 1,500 to 2,000 journalists from abroad. Additionally, for three years now, we've been open to bloggers as well. But we don't focus on getting a mass of bloggers. We select them. We just want to have bloggers with good reach, which are really interesting for our exhibitors. We started with about 200, and now we have 350 from 29 countries. This shows you that it is really good quality, and they are very international. In terms of articles, for example, just in Germany we have 12,000 articles. If we monitor the online articles, we have about thirteen or fourteen thousand online articles about ITB Berlin worldwide. What would you advise Mongolia to do after ITB Berlin to promote its tourism sector and further develop the benefits it gained as an ITB official partner? I would strongly suggest that Mongolia goes on in keeping up the contacts that they've made. They have made many good contacts—be it in the political field, be it in the association field, be it the trade and in the media. And if they keep up all these contacts, like juggling balls, they will manage to stay in the game. Mongolia now has entered the big soccer game of the world players, but they must see that they don't get kicked out. They must keep the ball rolling. And that is through constantly sending messages to the trade, to the journalists, by having the right marketing mix, and by also pursuing the legal framework and going on in the markets that they have discovered. This includes continuous speaking with the new tour operators with whom they have made contracts, and discovering even new clients. If you ask from me a secret recipe, I don't have it, because we did our work here. Where do you think the tourism world is headed next, in terms of technology, eco-tourism, and the latest trends? With the outlook at the moment, with more than 1.1 billion travellers worldwide, crossing borders, and about seven times more domestic travellers, I think that nevertheless with the development of the global GDP and economies, trips will tend to be shorter, but need to be more efficient. So the request for a unique experience is even bigger. People who look after tourism products have to shape their products in a way that they can cater to the needs of these people, to enable in a short period of time the maximum of an authentic experience. We also see that technology of course brings us almost everywhere with development. We see that the apps are the new internet. Apps will tend to replace the internet; this is a fact that we need to take care of in the future. And we also see that the sharing economy factor is one of the greatest drivers; not sharing only businesses, but sharing information. That means that the more authentically people report about a destination, the more likely it is that other people travel there. This is why we had a blogger speed dating session at ITB, where we generated about a thousand appointments between bloggers and destinations, so they could also start. We love the classical media reps, but we feel bloggers are also part of the media community now, and we have to deal with this phenomenon. I think today it is also very important to have good blogger relationships, and to create emphasis in the social media areas. Finally, I would hope that, as in the past, tourism helps us to understand each other better, because if we haven't seen the world, we don't understand our own microcosm. Ulaanbaatar: A Regional Financial Hub? April 21 (Mongolian Economy) London, New York, Hong Kong. These cities are some of the top financial centres in the world. Such cities deserve to be called the centre of the financial world, because their business environments host many prestigious businessmen, while their legal environments act as bodyguards to their assets. Could Ulaanbaatar step forward and become one of the region's top financial centres? Although such a future seems far away from what we see in Ulaanbaatar today, that doesn't mean it's impossible. In fact, the first steps have already been taken, said E.Temuulin, head of Ulaanbaatar's Economic Development Department. According to him, the city's economic development strategy has six big goals to implement. One of those six goals states that Ulaanbaatar will become a regional financial centre. This would be achieved in cooperation with the City of London Corporation, with a final agreement yet to be signed. The idea of UB becoming a regional financial centre might seem unrealistic. However, the citizens of Ulaanbaatar surely support it becoming such a prominent city. The term financial centre has broader meaning than skyscrapers and big banks or business people signing deals. These are only the materialistic bonuses that come with it. Having a financially important city indicates that a country has reached a higher standard of development. Life there is convenient. Citizens are content. Big companies that have opened offices there have plenty of choices when it comes to skilled human resources. Sadly, in terms of the above mentioned requirements, Mongolia has very little to offer. The biggest hindrance, though, is Mongolia's unstable and uncertain legal environment, noted B.Batsaikhan, Partner at Mongolia Opportunities Partners. Mongolia is known for its always changing laws and regulations. Such behavior from the government won't help Mongolia reach its targeted development goals. "This needs to be changed before it's too late", said B.Batsaikhan. "We have conducted several studies on how already existing financial centres developed. And we concluded that a stable legal environment was crucial. The legal environment includes taxation regulations, social protection, education, healthcare, and so on. Developing these sectors, and furthermore adjusting to the international standards, will enable UB with the possibilities to become one of these big financial metropolises", agreed E.Temuulin, the Head of City's Economic Development Department. If skyscrapers and suits were the only requirements of a financial metropolis, then Ulaanbaatar could easily be one. But when giants like JP Morgan, Goldman Sachs or Moody's come here to get actively involved in the country, it is questionable whether or not the capital can provide them with the required human resources. Providing foreigners with necessary healthcare is another obstacle the city will face. Mongolians are praised for their creativity and intellectual capabilities. Unfortunately, the country's education system has been critised for being too outdated. Businesswise, the city also hasn't earned a good name too. Thus, it means major changes and reforms should be done in Ulaanbaatar, if it wants to become big in financial sector. If we continue to argue over the long list of bad things in Ulaanbaatar, the list will only continue to grow. Changes must occur and start soon. These necessary changes won't happen in a day. B.Batsaikhan noted: "Can UB become a financial centre? Yes. But we will need to work very hard on that. It might seem a very distant reality, but in the end there is no fact that says we can't accomplish that." According to him, Mongolia, with its rich natural resources, lies in a very beneficial geopolitical region, neighboring the two big economies of Russia and China. Mongolia country is a very new market that's opening its doors for foreign investors. These are enough reasons to answer why investors are still interested in investing in Mongolia. 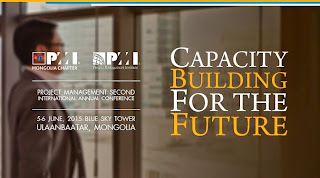 With such advantages Mongolia's capital can become a major player in the financial field. The recent establishment of the Ulaanbaatar Chamber of Commerce is a tiny step closer to the afore-mentioned goal. To achieve it, the best practices from abroad must be interpreted and integrated. Over the coming years, city authorities should stay true to their word, to reach for that lofty goal and establish Ulaanbaatar as a great city from any point of view. Ulaanbaatar, April 22 (MONTSAME) On April 22, the deputy mayor in charge of urban development and investment of Ulaanbaatar Mr S.Ochirbat inked a Memorandum of Understanding on cooperation with Chinese "Shang Fei" and "Xingjin Minzu" companies. These companies provide first-class services of building, installation, equipment and construction underlining in China and in several other countries. Under the MoU, the companies will cooperate in the implementation of the city-managed projects and programs. This action has been reflected in the Declaration of Partnership between the Municipal Administration and Private Sector, adopted during the "UB Investment 2015" forum last week. April 22 (gogo.mn) In scope of the E-payment card in public transport is to roll out from 1st of July, special equipment will be installed in 20 buses and 10 trolleybus and the trail is to start from tomorrow. Special equipment will be installed in 10 buses at М13 route and 10 trolleybuses at ТЗ route and 10 buses at М51 route. Further, special equipment of E-payment card is to be installed in 1200 buses that serving in Ulaanbaatar city. After having E-payment in public transportation, passengers should enter at the front door and read e-payment card at the card reader equipment near the driver and passengers must read their e-payment card again at the card reader when exit from the bus. In the first stage, cash box is to be installed in bus and remember that this cash box is unable for change. 450 Stations to sell and charge E-payment card will be placed near the bus stations and 50 stations will be placed in the biggest markets and supermarkets from May. Thus, passengers are able to buy e-payment card and charge. The main investor of the project is "Korea Smart Card" LLC and they have conducted research from January, 2015. Total budget of the project is USD 15 million and it was issued from Korea. Cost is expected to recover within 4.8 year from the service income. April 23 (gogo.mn) Capital city and Bayangol District Special Commission had an urgent meeting during 4.30-6.10PM yesterday on the information that the soil slide danger is threatening the residents of the apartment building 16 located in 14th khoroo of Bayangol district with decision to evacuate all the residents of the apartment building at 10PM. According to the official clarification of the situation from the Capital City Emergency Management unit the cause of the possible soil slide threat was raised by the soil slide in the hole dugged by the construction company to build the 18 storey building, therefore imposing potential threat to the nearby apartment building 16 which is located only 4 meters away from the construction site. Total of 178 residents out of 48 households with 224 residents were evacuated to seven hotels and were provided with food. The evacuation included 21 employees from the District Special Commission, 41 employees from the EMA, 50 police employees and other representatives from entities such as heating, electricity, health, prosecution and khoroo totaling to 173 employees. Evacuation of the residents was held until 11.37PM and all the units were sealed. D.Battulga, Head of the City Council said that the issue will be addressed in a very short period of time. April 23 (gogo.mn) D.Orosoo, Bayangol District Governor and Head of the Special Commission, made an official announcement on the situation raised at the 14th khoroo in Bayangol District. During the announcement he stated that although the evacuation costs were issued by the Reserve Fund of the Capital City, those will be refunded by the responsible parties. The owner of the 18 storey building project in front of the apartment building 16 is BGBG LLC and they were authorized to do construction works by the license issued from the Ministry of Construction and Urban Development dated July 22, 2014. Complaints from the residents led the governor of Bayangol District to send official letters to the responsible state entities. BGBG LLC initially received license to build parking lot back in 2008. Representative of BGBG LLC attended the meeting and confirmed that the company will reimburse the costs associated with the evacuation, but requested time due to current financial difficulties. Therefore all the costs of the evacuation will be financed from the Reserve Fund of the Capital City as of now. Moreover, the risky situation at the hole is to be treated with moulding according to Mr D.Orosoo. Capital City Special Commission meeting agreed to invalidate the construction license at the site. JAKARTA, 21 April 2015 (ASEAN Secretariat) - Mongolia expressed its strong interest in strengthening relations with ASEAN. This message was conveyed by the Foreign Minister of Mongolia, H.E. Lundeg Puresuven (Mogi: Purevsuren), during his meeting yesterday with Secretary-General of ASEAN, H.E. Le Luong Minh, at the ASEAN Secretariat. Noting that the 21st century is the century of Asia, Minister Puresuvan said Mongolia sees ASEAN as a key regional mechanism for cooperation in Asia. Within this framework, Mongolia would like to engage and work with ASEAN to pursue peace, stability and development of the region. He underscored that Mongolia will continue its active engagement in the ASEAN Regional Forum (ARF) process, which the country joined in July 1999. SG Minh advised Mongolia to explore with ASEAN avenues and opportunities to enhance practical cooperation in areas of mutual interest. He encouraged Mongolia to broaden its cooperation with ASEAN and to maintain its active participation in ARF activities. According to him, such cooperation activities could be useful and important manifestations of the close links between ASEAN and Mongolia. SG Minh also observed that Mongolia had close ties with all ASEAN Members States. Minister Puresuvan (Mogi: author must've been preoccupied) briefed SG Minh on Mongolia's grand celebration in July 2015 to commemorate the 25th anniversary of the establishment of democracy in the country, and its preparations to host the 11th Asia-Europe (ASEM) Summit in July 2016 in Ulaanbaatar. Noting that ASEM would also be commemorating its 20th anniversary next year, SG Minh wished Mongolia great success in hosting this important event. Ulaanbaatar, April 21 (MONTSAME) Taking part in an event of the 60th anniversary of the Bandung Conference (Afro–Asian Conference) in Indonesia, the Mongolia's Minister of Foreign Affairs met with Mr Le Luong Minh, the Secretary-General of the Association for Southeast Asian Nations (ASEAN). At the meeting, Mr Purevsuren granted to the ASEAN Secretariat a letter on willing to become a dialogue partner of the ASEAN, and then put forward a proposal on designing cooperation possible directions. Moreover, he invited Mr Le Luong Minh to visit Mongolia. Accepting the invitation, Mr Le Luong Minh affirmed that the ASEAN will determine directions for cooperating with Mongolia and will render support to Mongolia. Ulaanbaatar, April 23 (MONTSAME) Mongolia's Minister of Foreign Affairs Mr L.Purevsuren is taking part in the Asian African Summit 2015 which kicked off Wednesday in Jakarta of Indonesia under a "Strengthening South-South Cooperation to Promote World Peace and Prosperity" topic. The summit has brought together high level delegates from 30 countries such as His Majesty Abdullah II ibn al-Hussein, the King of Jordan; Mr Joko Widodo, the President of Indonesia; Mr Xi Jinping, the President of the People's Republic of China; Mr Kim Yong-nam, the Chairman of the Presidium of the Supreme People's Assembly of the Democratic People's Republic of Korea (DPRK); Mr Hassan Rouhani, the President of Iran; and Mr Shinzo abe, the Prime Minister of Japan. They are discussing issues of overcoming challenges to the ties between the two continents and widening the cooperation. In frames of the summit, Mr Purevsuren has met with his colleagues from Iran, Myanmar, India, Tunisia, Sweden; also with the Presidents of China and Indonesia, the Deputy Premier of the Republic of Korea, and Vice FM of the N.Korea. Ulaanbaatar, April 23 (MONTSAME) The Minister of Foreign Affairs of Mongolia L.Purevsuren gave a speech at the "Strengthening South-to-South Cooperation for World Peace and Development" themed Asian-African summit being held in Jakarta of Indonesia. The countries of Asia and Africa that cover 75 percent of the world's population and produce 30 percent of the world's total GDP have a broad possibility to make enormous contribution to ensuring global peace, security, democracy, good governance and equal development, he said. Mongolia fully supports the principles of the Non-Aligned Movement (NAM), the Bandung Conference which has become the foundation of South-to-South cooperation, and the New Asian-African Partnership, he added. The Minister said Mongolia is making its commitments to the South-to-South cooperation by sharing its practices and lessons of democratic transition, actively engaging in the international cooperation fund operations, and supporting the interests of the landlocked developing countries (LLCD). He also called the landlocked developing countries of Asia and Africa to join the Multilateral Agreement on Establishing an International Think-Tank for LLCD in Ulaanbaatar. The series of events dedicated to the 60th anniversary of the Bandung Conference has attracted some 5,000 delegates from 100 countries. It will continue with a tribute ceremony for the heads of states to be held in Bandung city on Friday. April 21 (gogo.mn) Today, signing ceremony on memorandum of cooperation between Mongolia and China which is to implement scholarship program is to be hold at 10.30AM at the Ministry of Education, Culture and Science. In scope of the program, 1000 students are to study at Chinese Universities under bachelor, master and doctoral programs. The Minister of Education, Culture and Science L.Gantumur and Ambassador Extraordinary and Plenipotentiary to Mongolia Mr. Wan Xiaolong will sign on memorandum of cooperation. April 21 (gogo.mn) During an official visit of Chinese President Mr. Xi Jingpin in Mongolia, Ts.Elbegdorj, President of Mongolia has promised to give pair of horses as a gift to Chinese President Mr. Xi Jingpin. Event to receive those gift horses named Altai and Kherlen was organized on April 15 at Tianjin, China. Opening of the event was started with speeches of Ts.Sukhbaatar, Ambassador to China and Liu Shenli, Director of state-owned "Agricultural Development Group". Representatives of Chinese Ministry of Foreign Affairs, the Ministry of Agriculture, State Property Committee, Chinese Customs Department, Quarantine Agency and Embassy diplomatic officials have participated in this event. "Agricultural Development Group" will feed the horses at their horse breeding place. "Agricultural Development Group" feeds specifically the horses which are gifted from foreign state heads. BEIJING, April 21 (Xinhua) -- Chinese Defense Minister Chang Wanquan on Tuesday met with Commander of Chilean Air Force Jorge Robles and Commander of General Purpose Troops of Mongolia Radnaabazar Sukhbat. Chang lauded the rapid growth of China-Chile relations since 2012, particularly between the two militaries. The Chinese military would like to work more broadly with the Chilean military, Chang said. Meeting the Mongolian military leader, Chang reviewed Chinese President Xi Jinping's state visit to Mongolia last August, saying that presidents' consensus has set a direction for bilateral relations. Chang called for the two militaries to maintain exchanges between high-ranking officers, continue defense security consultation and expand joint drills. Radnaabazar Sukhbat said Mongolia would like to work more closely with China in peacekeeping missions, anti-terror operations, joint drills and training. MINSK, 23 April (BelTA) – A delegation of the Belarusian Ministry of Foreign Affairs led by Deputy Minister of Foreign Affairs Valentin Rybakov is in Mongolia on 22-25 April, spokesman for the Belarusian Ministry of Foreign Affairs Dmitry Mironchik told a briefing on 23 April, BelTA has learned. The program of the visit will include consultations between the Ministries of Foreign Affairs of Belarus and Mongolia. Valentin Rybakov is also expected to meet with Deputy Minister of Construction and Urban Development of Mongolia, chairperson of the Mongolian part of the joint Belarusian-Mongolian commission on trade and economic cooperation Gochoosuren Baigalmaa and visit a number of industrial companies of Mongolia. April 23 (MFA of Belarus) On April 23, 2015 Ulaanbaatar hosted third round of consultations between the Ministries of Foreign Affairs of Belarus and Mongolia. The Belarusian delegation was headed by Deputy Minister of Foreign Affairs Valentin Rybakov, the Mongolian delegation – by Deputy Minister of Foreign Affairs Navaan-Yunden Oyundari. Ambassador of Belarus to Mongolia Stanislav Chepurnoy, representatives of the Belarusian Foreign Ministry and Belarusian diplomatic mission in Ulaanbaatar also took part in the consultations. The sides discussed a wide range of issues related to the development of bilateral relations, including exchange of high-level visits, expansion of political, economic, scientific, educational and cultural ties, widening of the legal base of bilateral cooperation, interaction in the international arena and regional issues. The delegations considered issues related to the preparation of the 3rd session of the Joint Belarus-Mongolian Commission on Trade and Economic Cooperation to be held in June 2015. April 23 (infomongolia.com) Today on April 23, 2015, the Embassy of the Republic of Turkey in Ulaanbaatar headed by Ambassador Extraordinary and Plenipotentiary, Murat Karagoz celebrated the Turkish Children's Festival with schoolchildren of the Secondary School No.5 in Ulaanbaatar. Following a cultural performance, the Embassy staff and the school administrators headed by Director B.Chinbat paid tribute to the Monument of Mustafa Kemal Ataturk, which is located in front of the school. Afterwards, Ambassador Murat Karagoz welcomed some children at his office, who gave over his role as an envoy to a fifth-grade student B.Nomuundari, and in a question what would he do in the first, he said to broaden relationship between the children of the two countries. Also, he added to pay a particular attention on creating an international school and a hospital in UB. Turkish Children's Festival is being celebrated internationally every year since 1979, where children from Mongolia are also invited and this year, 13 kids left for Turkey to co-celebrate the Festival. Ulaanbaatar, April 21 (MONTSAME) A Vice Speaker of parliament R.Gonchigdorj together with Ya.Sodbaatar MP and the Ambassador Extraordinary and Plenipotentiary of Mongolia to Hungary T.Gandi attended an international conference titled "Buddhism in Mongolia: Past, present and future" last week in Budapest on occasion of the 380th birth anniversary of High Saint Zanabazar. The international workshop was co-organized by the Department of Mongol and Inner Asian Studies, the Research Centre for Mongol Studies, the Budapest Centre for Buddhist Studies at the Faculty of Humanities of ELTE, the Institute of Ethnology at the Hungarian Academy of Sciences, and the Embassy of Mongolia in Hungary, with a participation of 50 Mongolists from 16 countries. During the event, the researchers and scholars presented characteristics of Buddhist and cultural creative arts made by Zanabazar and new facts and documents from the latest archaeological sources. Following the event, the Mongolian MPs with Tamas Sneider, a Deputy Chairman of the National Assembly of Hungary, to share views on the Mongolia-Hungary cooperation and on activating the inter-parliamentary collaboration. Mr Sneider stated that Hungary will re-open its Embassy in Mongolia this May. April 21 (infomongolia.com) The Eastern Military District of the Armed Forces of Russia stationed in the Republic of Buryatia earlier announced to host the "Selenge 2015" Russian-Mongolian joint military field exercises in its territory in August-September of 2015. So on April 20, 2015, the Military District affirmed that the joint exercise will be taking place in the third week of August. Moreover, for the first time the joint Russian-Mongolian military exercise "Selenge 2015" will take place at the training complex namely "Tsugol" in the Trans-Baikal region, where about 500 personnel from Eastern Military District are planned to participate and up to 350 military personnel from the Armed Forces of Mongolia. Also, as of technical equipment Mi-24, Mi-8, Su-25 will be stationed and during the exercises counter-terrorism operations with crossing water obstacles will be worked out. In late April, representatives of the Eastern Military District and the Armed Forces of Mongolia will be having bilateral talks on the composition of staff management, tasks forces and the order of practices that expected to held in Ulaanbaatar, Mongolia. The "Selenge" joint military field exercises beind held annually since 2008. The last two years they were held in Mongolia at the "Doityn Shar Nuur" in Sergelen Sum of Tuv Aimag in 2013 and at the "Selenge 2014" at the "Munkh Khet" polygon in Dornod Aimag. April 23 (gogo.mn) T.Ayursaihan, Head of Fair Competition and Consumer Protection Agency received Toshinobu Kato, Chief Representative of JICA Mongolia Office. JICA Mongolia Office implements project on attracting investments into all sectors and cooperation. T.Ayursaihan, Head of Fair Competition and Consumer Protection Agency expressed his gratitude to JICA Mongolia Office on implementing project to improve competition environment in 2015 at Fair Competition and Consumer Protection Agency. "Although our agency implements number of important laws, we have no branches in rural areas and we have only 36 full-time employees. Therefore, it is important to strengthen fair competition nationwide and improve the skills of state inspectors who protect consumer rights. It is very important that JICA project is to be implemented at this time." said T.Ayursaihan, Head of Fair Competition and Consumer Protection Agency and they exchanged ideas on how to effectively implement the project. Moreover, he noted that the signing of EPA became the first Mongolian free trade agreement and he expressed that he will focus on stopping the unfair competition and increase in the flow of trade and investment between two countries. Mr. Toshinobu Kato, Chief Representative of JICA Mongolia Office said: "Japanese business entities and investors mostly focus on fair competition and favorable business conditions. Thus, we have to concentrate on improvement of competition environment and consumer education on consumer culture and I am confident that we will achieve specific result within this project." In scope of this project, Japanese assessment team will arrive in Mongolia and work at Fair Competition and Consumer Protection Agency from 4th to 14th of May. April 21 (International Relations and Security Network) Neil Thompson believes that Mongolia, which is resource-rich and relatively democratic, is set to become the bellwether state for 21st century Eurasian politics. That's because the way Ulan Bator is balancing its ties with Russia and China could provide a model for other Central Asian states to follow. Many Westerners continue to view Mongolia through the lens of its distant past, when this vast country served as an incubator for the conquering waves of nomadic horsemen that periodically appear throughout history. However, the origins of today's modern Mongolian republic and its foreign policies reflect its troubled birth as a state on a historic fault line between many competing empires and tribes. Yet that might be about to change, with this landlocked and impoverished but resource rich and democratic Asian country becoming the bellwether state for 21st century Eurasian politics. In the 18th and 19th centuries, the region that is now the modern state of Mongolia was, like the rest of Central Asia, first squeezed between and then divided by the expanding Russia and Chinese empires – both cultures which had long suffered from Mongol depredations themselves. The popularity of this political arrangement locally can be measured in the length of time it outlasted the Qing and Romanov dynasties. In 1913, less than two years after the fall of the Qing, Tibet and Mongolia signed a treaty declaring their independence from China. Independence, in turn, inspired nationalist sentiment for an enlarged Mongolian territory that embraced Mongols in both China and Russia. The Russian reaction however was an ominous sign of things to come. Despite signing a treaty with the new Mongolian government, Russia and China's disintegrating central government issued a joint declaration stating that Mongolia was still under Chinese suzerainty. This was reinforced by a joint Russian-Chinese-Mongolian treaty in 1915 placing an autonomous Mongolia back under formal Chinese oversight. Russia's striking respect for the official boundaries of the now-vanished Qing dynasty is easily explained. The Japanese defeat of first China in 1895 and then Russia in 1905 added a third predatory power to north-east Asia. Secret treaties at the end of the Russo-Japanese War of 1904-05 initially forced tsarist Russia to accept Mongolia lay within Japan's sphere of influence. Despite a decade of unsavory horse-trading between imperial Japan, tsarist Russia and China's warlords, it would be Russia into whose orbit the new 'autonomous' state of Mongolia would ultimately be drawn. 'Outer Mongolia', as Mongolia was then called, was tragically caught up in the drama of the Russian Revolution. It was alternatively occupied and fought over by local nationalists, China's warlord-dominated Beiyang government, White Russian troops and their semi-official Japanese allies, and the Red Army together with a nascent Mongolian communist movement. The Bolshevik intervention was the decisive one and in 1925 the People's Republic of Mongolia was proclaimed. Mongolia became a Soviet satellite state of the in the same mold as the countries of Central and Eastern Europe. It would remain isolated from the outside world for seven decades, integrated only with its Soviet mentor and economic prop. Nowadays, this country of just three million is still encased between her old occupiers, Russia to the north and China to the south, east and west. However the threat from Japan ended after the Second World War, and in 1986 Mongolia restored friendly diplomatic relations with China that had long suffered during the Sino-Soviet split. The 1990 withdrawal of the Soviet military and Moscow's political and economic support ended decades of communist government. And while Mongolia was plunged into food shortages and economic collapse, a new and vibrant democratic system was kept alive and functioning. Probably thanks to this Mongolia has not succumbed to the 'resource curse' yet, despite sitting on vast quantities of untapped mineral wealth. Minerals already make up over 80% of Mongolia's annual exports, and that is expected to rise to 95% after a number of massive mining projects come on-stream. Despite squabbles between foreign companies and the at-times erratic Mongolian government, foreign direct investment (FDI) from a number of different foreign states has been transforming its post-communist economy. Mongolia was one of the world's fastest growing economies until recent times, with high growth rates reported in 2012 and 2013. A genuinely free Mongolia presents a curious picture today. Twenty-five years after independence Mongolia is still a lone democracy in a region of autocracies (albeit with Kyrgyzstan as a credible contender to join it). Certainly it is a lot freer and less corrupt than its two giant neighbors though there have been plenty of bumps along the way in recent years, including a state of emergency being declared in 2008 after a disputed election led to a drunken riot in which five people were killed. Accusations of corruption and electoral malpractice have also been found to have some substance. In 2012, Enkhbayar Nambar – the former Russian-friendly president - was jailed on corruption charges before being pardoned by his successor (and long-time rival) the following year. The antics of the landlocked and impoverished state's rapidly expanding merchant navy also continue to raise eyebrows, even as it diversifies revenue streams in an economy heavily dependent upon commodity prices. Geopolitically, Mongolia continues to face the tough choices of its location between a reenergized authoritarian Russia and a booming communist China. To its north it has a revanchist neighbor that is currently spearheading a comparatively protectionist customs union as an economic means to a political end. Russia's own creaking economy is once again bearing the cost of subsidizing the underdeveloped neighbors it has persuaded or bullied back into the fold. As Moscow has revived itself under Putin, it has also sought to breathe new life into bilateral economic and political ties with Mongolia. Russia remains the only alternative choice to China for Mongolian export routes, something that Ulan Bator's politicians think about when they remember past Kremlin arm-twisting over their Soviet-era debts to Russia. To the south, China remains the booming source of Mongolia's new found prosperity, should the legal wrangling over various mining projects ever end. Beijing shares Mongolia's flexible attitude to the rule of law, desire for efficient economic growth, and lately even a showy crackdown on corruption. Yet many Mongolians remain disturbed by their southern neighbor. While Russia is vast but under populated, China surrounds them on three sides and already rules a Mongolian population that's twice as large as Mongolia's. Worries also abound that the mining boom will turn Mongolia into an economic satellite of China in much the same way that the country was a political satellite of Russia in the twentieth century. Having tasted the fruits of full sovereignty Ulan Bator does not want to lose it as wealth literally starts to spring from the ground under its feet. At present, China is the overwhelming export market for Mongolia, buying 89% of the coal, metals, oil and even livestock that Mongolians send abroad each year. However the figures for China are somewhat deceptive as the impact of large scale FDI by Western mining companies has yet to be fully felt. For instance, British-Australian mining giant Rio Tinto spent $6 billion preparing its copper mine at Oyu Tolgoi and believes it will extract $8 billion in revenue per year for the next several decades. Ulan Bator has also tried to diversify away from overreliance on China, most notably by signing a free trade agreement with Japan earlier this year. With this in mind, analysts predict that Mongolia's ever-closer connection to the Chinese market will not necessarily translate into Beijing's increasing political influence there. Indeed, the most interesting aspect of the Sino-Russian-Mongolian relationship is the growing importance of Mongolia's agency relative Beijing and Moscow, a reversal of the situation in 1915. In this sense, Mongolia is a microcosm for the states of the wider Central Asian region which have also been trapped between the two giants since the 17th century. Although Russia and China have been careful not to step on each other's toes, their economic interests in Mongolia are basically at odds. China has simply tried to pull Mongolia ever closer into the structural embrace of its giant economy, whereas Russia has had to trade on its diminishing assets in the country – such as writing off Ulan Bator's debts in 2003 and once again in 2009. Despite Moscow's scrambling to secure access in a share of Mongolia's natural resources, its long term success can perhaps be measured by the news that the Mongolian parliament voted in October 2014 to adopt a rail gauge compatible with China's in order to develop a special 240-kilometer track from the Tavan Tolgoi coal basin to the Chinese border. 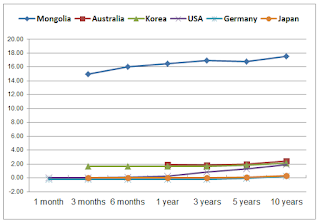 Coal is Mongolia's second biggest export, and China is its largest customer. The new gauge will reduce the cost of transporting coal to China by a third, from $6 a ton to $4 a ton, once the line is completed in late 2016. In addition, the Oyu Tolgoi mining project was once envisaged by Moscow as a means to leverage its split ownership of the trans-Mongolian railway line into economic influence. Russia offered to build a railway link to the main line, and run the copper extracted to far eastern ports via Russia. Instead the contract was given to a Canadian firm which is now part of Rio Tinto and the precious metal is simply trucked to the Chinese border eighty kilometers away. So, despite the maneuvering of successive Mongolian governments to ensure they balance trade with China against trade with other countries, Ulan Bator has also ensured that it remains free from participating in Putin's pet Eurasian Economic Union project. There is a cross-party understanding within political circles that Mongolia has no permanent friends or enemies today, only trading partners. Ulan Bator today ruthlessly seeks out opportunities to cooperate with foreign parties for its own economic development and discards them quickly if a better offer is made. China has found it a tough partner to bargain with economically. Meanwhile, Russia may find that the rest of Central Asia prefers to follow the lead of Ulan Bator as the fruits of Mongolia's socio-economic experiments bear fruit compared to their own stagnant kleptocracies. The era of Eurasian states having to choose between geopolitical 'clubs' is over and Ulan Bator knows it. Neil Thompson is Content Editor at News4Media and freelance contributor at the Diplomat, Informed Comment, Geopolitical Monitor and similar publications. He holds an MA in International Relations of East Asia from the University of Durham. April 23 (UB Post) Donations worth 28.5 million MNT were sent to Sukhbaatar Province on Wednesday, immediately after emergency management officials finished collecting donation goods. Bayars Construction LLC donated five new gers and JAH LLC gave 1,500 pairs of gloves. Female Diplomats Club of the Ministry of Foreign Affairs gave financial aid, while the Democracy Justice Youth Union of the Mongolian People's Revolutionary Party sent fire-proof blankets, burn creams, sprays and bandages worth 10 million MNT, jointly with the Mongolian Women's Association. "All these donations will help victims very much. I thank everyone who joined the campaign. We will deliver the donations to the intended as soon as possible. Also, we have received a call today (Wednesday) from several national producers and they promised to donate 53.5 million MNT worth of food products to the victims," said Kh.Batbileg. "We are cleaning winter quarters that could potentially catch fire at wildfire focus areas," they said. Delegates of the Ministry of Food and Industry (MFI) headed to wildfire zones Mongolia's eastern region on Wednesday with financial aid and food products valued at 50 million MNT. Asian Development Bank's project coordinators in Mongolia also donated 3.4 million MNT to the campaign to help soums hit by wildfire. Ulaanbaatar, April 22 (MONTSAME) Headed by R.Burmaa MP, the Minister of Food and Agriculture, trucks with aid headed Tuesday for eastern provinces affected by fires. The Minister will also witness conditions of the aimags. For the time being, the Ministry has collected foods costing 22.4 million Togrog, fodder of MNT 5.2 million, medicines for livestock of MNT 4.7 million and cash of 17.7 million. Staffers of the Ministry and its agencies have donated one-day salary to the aimags. Moreover, national producers have contributed to the humanitarian aid, for example, the assistance campaign has been joined by some 20 companies of the city and localities including the "Ogooj chikher boov", "Oyog", "Tengeriin khishig", "Green city" and "Khangain guril" LLCs. The money is donated also by companies of livestock medicines, officials of the "Sustainable livelihood" project and other projects of the Asian Development Bank and Agricultural Marketing organization. Ulaanbaatar, April 21 (MONTSAME) At its meeting on Monday, the cabinet obliged U.Khurelsukh, the Deputy Premier, to take some measures to fight steppe fires in eastern region of the country as well as livestock diseases, and to render aid to families affected by the disasters. Gers (national dwelling) will be given to 44 families who had lost their shelters in fires in Dornod, Khentii and Sukhbaatar aimags, and nine Russian-made vehicles will be delivered to these aimags for the emergency and medical aid services. In addition, 730 tons of hay will be given without charge to those families and herders affected by the fires. The cabinet meeting on Monday tackled money of 470 million Togrog for the fuels to be used for transporting the aid. In addition, six "BMP" vehicles owned by the General Headquarters of Mongolian Armed Forces (GHMAF) will be passed to the National Emergency Management Agency (NEMA) in accordance with an order of the President and Commander-in-Chief of the MAF. They will be used in combating the disasters without armed techniques. A sum of 842 million Togrog was tackled at the cabinet meeting to fight forest, steppe fires and diseases of livestock and animals, to reverse the damages, destroy carcasses, make sterilization and disinfection, cure the animals. As of April 20 of 2015, one person died and seven people got injured in 86 fires near the capital city and in 14 provinces. Some 6,000 people and 650 vehicles from the Armed Forces, the NEMA, police and frontier services are fighting the fires. Ulaanbaatar, April 21 (MONTSAME) On April 21, the Chairman of the National Emergency Management Agency the Brigadier-General T.Badral made an official statement on the status of the ongoing forest and steppe fires. Present were also the Secretary of the NEMA, the Emergency Colonel M.Enkh-Amar, and the head of Fire Fighting Department the Emergency Colonel S.Zaluukhuu. Mr Badral said a total of 89 fires occurred since the first in 2015 forest and steppe fire was recorded on February 4. The factors that are seeding the fires are the severe dryness caused by the low snowfall last winter and the relatively high speed of winds, he said. The fire started from Bayan-Ovoo soum of Khentii aimag on April 13 has spread rapidly to Tumentsogt, Monkhkhaan and Sukhbaatar soums of Sukhbaatar aimag, due to the wind of 21-22 m/sec, he went on. The NEMA isolated the fire successfully on April 17, with recruiting additional human power from bordering aimags and including military personnel from the General Headquarters of Armed Forces. Some 600 people participated in the process, informed Mr Badral. The Cabinet had issued a decision to give gers (national dwellings) to the families suffered, to issue water trucks and ambulance cars to serve in the hotspots, and to hand over 730 tons of reserved hay to the victimized herders, said the Secretary of the NEMA M.Enkh-Amar. He added that, under the decision of the General Commander of Mongolian Armed Forces and the President of Mongolia, six war-machines are to be dedicated to the fire-fighting, unarmed. The head of the Fire Fighting Department of the NEMA said that a team is working on isolating the fire, which is coming from Russia, outside the border. There is no information confirming the isolation of fire in Dashbalbar soum of Dornod aimag, so far, he added. Ulaanbaatar, April 21 (MONTSAME) The Ministry of Food and Agriculture reported Tuesday that Makh Impex, Talkh Chikher and Mill House companies have donated products worth of 50 million Togrog to support the victims of fire that has currently reached a disastrous level. The workers of Makh Impex LLC also donated their one-day salary, Mongol Eco Makh LLC – products worth one million Togrog, Khatan Suikh Impex LLC – worth 900 thousand Togrog, and Khun-Od LLC – worth 788 thousand and 400 Togrog. The donation frameworks have been initiated by the Ministry in purpose of helping the victimized citizens, herders and workers, as well as to the volunteers and servicemen who are taking part in the fire fighting, physically and mentally, said the Ministry. April 22 (gogo.mn) The Minister of Labor S.Chinzorig awarded certificates to members of Mongolian team which is to compete in 43rd Edition of the World Skills to be hosted in Brazil in 2015 from August 11-16. Certificates were awarded to P.Galbadrakh from Mining and Energy Polytechnic College in Darkhan aimag, J.Enkhchimeg from Construction Polytechnic College, B.Mungunshagai from Vocational Training Center in Darkhan aimag, Kh.Lhagva, from Construction Polytechnic College, B.Munh-Erdene from Institute of Technology, D.Narmandah from Institute of Technology, B.Undarmaa from Factory and Art Polytechnic College and G.Enh-Amgalan from Vocational Training Center in Uvurhangai aimag. Mongolian team at World Skills 2015 is to compete in nine categories including bricklaying, wall and floor tilling, welding, turning, electronic, carpentry, hairdressing, beauty therapy and cooking. Last year, two participants were selected in each category from "Mongolian skill 2014" and contest was conducted again between remaining two participants and selected the best to represent the country. Participants ranked second were awarded with MNT 1.5 million voucher to buy professional equipment and tools. In addition, trainers who are preparing skilled professionals were awarded. Ulaanbaatar, April 21 (MONTSAME) A project on combating HIV/AIDS will be co-implemented in 2015-2017 with a financing of USD 5 million. The Ministry of Health and Sport established Monday the contract with the National Center of Lemology and some associations for youths and prevention of drugs. The project's financing will be spent on measures for preventing HIV/AIDS, widening programmes to be implemented for specific social groups, upgrading the quality and adequacy of aid at all volumes and strengthening a monitoring system for the programme. Since 2003, Mongolia has approved and implemented 11 projects with financing of USD 50 million for combating HIV/AIDS, tuberculosis and for improving the health system. USD 16.5 million of the total money has been spent on national measures for preventing HIV/AIDS. April 23 (gogo.mn) Mongolian surgeons at the National Kidney Transplant Team have successfully conducted the 100th kidney transplant surgery yesterday. Kidney transplant surgery commenced in Mongolia in 2006 and the 100th successful surgery was conducted yesterday almost 10 years after. Patient is 16 year-old boy E.Munkhbaatar and his father donated his kidney. B.Byambadash, Head of the Kidney Department at the First State Clinic Hospital, assured that both patient and donor are in good condition after the four hour surgery. Kidney transplant surgery costs MNT 12 million in Mongolia and the MNT 8 million is refunded from the Minister of Health package and the rest MNT 4 million is paid by the patient. Although the subsidies for this surgery are really good the constant increase of the costs of one time sterile surgical equipment and tools creates extra load for state, therefore some of the tests are charged from the patient. Kidney transplant team members have mentioned that the costs of the surgery have been evaluated by the financial department of the hospital and the results came up to MNT 25 million covering all the necessary tests, markers, equipment and tools, surgeon fees. The renewed estimates were submitted to the Ministry of Health and Sports. There are 240-250 patients on dialysis currently. If there are donors all of those patients are able to be treated with kidney transplant. Kidney transplant patients have to receive 1-3 types of medication throughout their lifetime and those medicine are fully subsidized by the Government through the Health Insurance Fund. Ulaanbaatar, April 23 (MONTSAME) The Secretariat of the State Great Khural opened Thursday a Book Event at the State House, on the occasion of the World Book Day observed every April 23. Nine book-marketing organizations are taking part in the action to introduce and sell newly-published books and to get comments from readers who work in legislative and policy-making levels. On the occasion of the event, the American Center for Mongolian Studies donated over 430 English books with 163 different titles classified in law, economics, marketing, management and other scientific fields. The Chairman of the State Great Khural Z.Enkhbold legged the event this afternoon. April 23 (gogo.mn) "Khusugtun" Mongolian ethnic group was selected as semifinalist at "Asia's Got Talent" show. They had passed the first stage which was held on March 12 and surprised the judges by performing Mongolian traditional "khuumii" (throat singing) and dance. While the voting is similar to other voting processes in the Got Talent franchise, the revelation of results would be slightly different, to be revealed in the following week rather than the next night (as semifinal rounds are only once weekly, barring replays). Also, in another twist, the Golden Buzzer returns wherein each semifinal round, the judges would use it as one unit to send one act straight to the finals. This is similar to the Judges' Choice in the other local franchises, albeit one ahead of the vote rather than after and based on the vote. Aside from the Judges' Choice through the Golden Buzzer, the two acts with the most public votes would also advance to the finals. There would thus be a total of nine finalists emerging from the three semifinal rounds. There are three easy ways to vote including SMS Voting, Facebook Voting and App Voting. Voting for Khusugtun will be started from April 23-27. Eight participants are competing with Khusugtun including pianist, singer, girl`s rock band, guitarist. One of them who collected the most votes from the audience will have right to compete for the final. The winner will be awarded with prize of US$100,000 and an opportunity to perform at the Marina Bay Sands. April 21 (gogo.mn) Today, Jean-Jacques Annaud who is paying visit in Mongolia met with City Mayor E.Bat-Uul. Jean-Jacques Annaud said "Before, I have visited in Ulaanbaatar with screen writer and we travelled around Eastern aimags. I started my research on Mongolian culture and I liked the Tuv aimag. During the visit, screen writer of "Wolf Totem" made discussion with library editor of Central Library." "People who watched "Wolf Totem" expressed their interest in Mongolia and they say they will visit in Mongolia. R.Ankhnyam is very talented actress and she has potential to play in many films in the future. I have thought to contribute to the development of Mongolian film industry. Mongolia has a big potential to receive foreign films while the world has opportunity to receive Mongolian film." "I am pleased for Mongolian authorities have expressed their high interest in making film that promotes Mongolia and I am happy for policy to develop Mongolian film are being discussed." City Mayor Bat-Uul said: The difficulty for developing Mongolian film industry is small market. However, involving the biggest representative like you in the Mongolian film industry is very important for us." In response Jean-Jacques Annaud said: "I have no problem. There are many foreign competitors. However, we have to focus on small market and other things. Yesterday, I have discussed with the Prime Minister and the President on how to solve this problem. As I see, the most important thing is to get advice and help from experts on how to attract Mongolian audience. TV channel is more effective way to deliver film to the audience than cinemas." April 23 (gogo.mn) World acclaimed Academy Award winning film director Jean Jacques Annaud visited Mongolia by the official invitation of the President of Mongolia Ts.Elbegdorj during the April 20-21. During his short visit he held meetings with Minister of Education, Culture and science L.Gantumur, Speaker of Parliament Z.Enkhbold (for coverage click here), President Ts.Elbegdorj and City Mayor E.Bat-Uul (for more in detail please click here). Talks with the state officials mainly touched the issues related with promoting Mongolian movies to the global market and sharing the views on preparing the grounds for development of the film industry in Mongolia. Moreover, the director of the famous movies such as Enemy at the Gates, Seven Years in Tibet, Brothers, Quest for Fire and many more met with the Mongolian film makers. The reports of his meetings can be accessed here. Here we are delivering the short journey of Jean Jacques Annaud in Mongolia in photos. April 22 (gogo.mn) World acclaimed Academy Award winning film maker Jean Jacques Annaud visited Mongolia during April 20-21 by the invitation of President of Mongolia Ts.Elbegdorj. Jean Jacques Annaud has successfully launched his latest movie Wolf Totem depicting the culture of the nomads featuring Mongolian actress. He honored our news agency with an exclusive interview. Through this interview we tried to convey to our viewers the experiences and fascination of this great man behind the Oscar winning Black and White in Color, controversial Seven Years in Tibet having led him to receive lifelong denial at entry to China, much fascinating The Bear, completely new genre in his repertoire The Lovers, attractive Enemy at the Gates with Jude Law and lately the Wolf Totem which he directed by the invitation of the Chinese film production. Moreover, Jean Jacques Annaud shared his thoughts on Mongol film industry development and to which direction we need to steer it in order to gain the global attention, therefore leading to the promotion of the Mongolian actors and movie makers to advance to the global level. Though we had very limited time during his tight schedule of visit, the interview itself, the time spent just listening to this man's words was a great pleasure and an enormous learning experience for us and most of all the sincerity and fascination this man conveys in every way. April 23 (infomongolia.com) InfoMongolia's partner the Trebol Sports International (TSI), an agency that specializes in helping players to kick start their careers in the Asian football leagues, announces that the TSI's client, Uros Poljanec (Slovenia) had signed a contract with Mongolia's Khoromkhon FC. The information was provided by Sporting Director of Trebol Sports International, Bryan Lim today on April 23, 2015. Uros Poljanec, 24, will be the first Slovenian to play on Mongolian soil and to feature for the Mongolian champions in the domestic League as well as the 2016 AFC Cup qualifying tournament, which is slated to be held in August 2015. In his comment, U.Poljanec said, "I view this as a huge step for my career as not many players in Europe get a chance to play in regional club competitions. I am happy and motivated to be part of the Khoromkhon FC setup. I understood from my legal representatives, Trebol Sports International, that I am the first Slovenian to play in Mongolia. As the saying goes, it is usually hard to forget the first one. Hence, I am determined to do my best so as not to let my country down". A youth product of renowned Slovenian side, NK Maribor, Uros did not hesitate when the chance was offered to him 2 weeks ago. "To be honest, I was initially skeptical about the opportunity as I wasn't sure of the lifestyle and football in Mongolia. However, when my representatives told me about the progressive standards of Mongolian football and asked if I would like to be part of this exciting project, I had no qualms in accepting the opportunity. I will like to thank Trebol Sports International for giving me this chance to join a big club like Khoromkhom FC." Uros was part of the Slovenian U-19 National Team, which played Finland, England and Slovakia in a mini tournament. He hopes that Khoromkhon FC will benefit from this particular experience in his career. "Playing for the National Team was really special. When you are part of the National Team setup, you are always driven to prove yourself to the world. I may be young but I think my experience with the National Team will come in handy on the pitch, especially in the AFC Cup qualifying tournament. It would be tough to progress to the next round but everyone is on an equal footing in the qualifying tournament. There are no firm favorites, so we will do our best and win." Uros, who enjoys walking and playing with his dog in his spare time, will arrive in Ulaanbaatar on April 30, 2015 via flight SU3850. He will make his debut in the Mongolian Niislel League, which is scheduled to kick off on May 09, 2015. "I am really encouraged to take up this challenge and help Mongolian football in whatever I can, especially through my performances on the pitch. If I can inspire more local kids to take up the sport, it will be a great achievement for me. I want to be part of this great story." Uros is the sixth player whom Trebol Sports International has placed in Khoromkhon FC. The previous five were David Low (Singaporean), Raimi Hassan (Nigerian), Akil Pompey (Trinidadian), Ryan Fante (Canadian) and Yudai Ikeda (Japanese). The five players helped Khoromkhon FC to a Mongolian Cup title and first runners-up League position in 2012. "With the 2018 FIFA World Cup Qualifiers coming up, I felt that I needed to be training and playing at a high level constantly,"
HARMON, April 23 (Pacific News Center) - Guam's success in recent months leading up to automatic qualification to the second round of 2018 FIFA World Cup Qualifiers continues to open doors to Asia's professional football leagues, with the selection of the Matao's Jonahan Romero to Khoromkhon FC, defending champion of Mongolia's premier league, as the latest signing. "With the 2018 FIFA World Cup Qualifiers coming up, I felt that I needed to be training and playing at a high level constantly," said Romero, who will be departing to Ulaanbaatar, Mongolia the first week of May. "I'd been going on a few trials with clubs in different Asian countries and it came down to contract negotiations. My agent, who's based in the U.S., told me that playing for this club would open more doors for me, since it's less difficult to go from one professional club to another, instead of taking a break like I had done. "I had to take this opportunity – I thank God for this and I pray to God that more opportunities will come out of this," Romero added. Khoromkhon FC is based out of the Mongolian capital of Ulaanbaatar and plays in the Niislel League, or Capital League, the country's premier league. The club won its first league title in 2005 and is the league's current defending champion. Other teams in the league include Erchim, seven-time league champions that had earned a spot in the AFC President's Cup in 2012, FC Ulaanbaatar, Khangarid, Selenge Press, Ulaanbaataryn Mazaalaynuud, and Ulaanbaatar University. "J.R. gaining a professional contract to play in the Mongolian premier league underlies his desire to continue improving as a player," said Gary White, Guam men's national team head coach and Guam Football Association technical director. "The message to all of the Matao's potential and prospective players has been very clear from the beginning: to be considered for a spot on the roster, they must be constantly pushing themselves to play at higher levels. "After the team's success in Singapore, spots on the Matao's roster for the upcoming 2018 FIFA World Cup Qualifiers will be more competitive than ever. We will be keeping a close eye on J.R.'s performances in Mongolia," White added. The Matao will next play Turkmenistan and India on June 11 and 16, respectively, in Guam, to open its FIFA World Cup Qualifiers campaign. Guam recently was drawn into Group D and will also compete against Asia's top team – I.R. Iran – and Oman, rounding out the group's five countries. "I'd like to thank GFA President Richard Lai and the executives for their continued support of football development in Guam and also the Gaffer (White) for continuing to push us to play at higher levels," Romero said. "I'd also like to thank Keith Dickson, who has been an amazing sponsor while I've been here in Guam and a great father-figure who has helped me live my life here in Guam with football through coaching and training opportunities. I'd also like to thank my Strykers FC teammates, who've all been very supportive of my decision. Additionally, I'd like to thank Richard Hawes who's also been there for me a lot, coach Rod Hidalgo who has helped me improve my overall fitness and speed, Unified Gym and Paradise Fitness Center for allowing me to train there and their support as well. "I definitely would like to thank my girlfriend Ana Borja, who just gave birth to my son, too. She's been 100 percent supportive – it's going to be tough for her along the way, but she's my real MVP, my champion, and she'll be holding down the fort while I'm there. I really want to thank her for allowing me to pursue this," Romero added. April 21 (UB Post) The Mongolian Fencing Association organized the State Fencing Championship on April 18 and 19 at Futsal Palace. Over 80 fencers from five clubs took part in the championship. Khangarid Club's B.Batkhuu won gold in the men's category. He was followed by Ts.Jigjidsuren, E.Dulguun and E.Enkhdelger. Three-time state champion and Mongolia's first gold medalist from international fencing tournament B.Battumur didn't participate in this year's State Fencing Championship. B.Gerelmaa won gold in the women's category and became a state champion for the third time. She was followed by B.Amarzaya of Uurkhachin Club, M.Jargalmaa and A.Khaliunaa. April 21 (UB Post) The Union of Mongolian Artists is organizing an exhibition called "Bayankhongor Land". The exhibition is on view from April 15 to April 22, at the Union of Mongolian Artists. The exhibition includes more than 90 pieces including paintings, sculptures, and engravings. Thirty artists from Bayakhongor Province, including youth and senior artists, participated in the exhibition. Exhibitions presenting the work of many different artists give viewers an opportunity to explore different art styles, themes, techniques, and ideas all in one place. The artists of Bayakhongor Province organized their first joint exhibition in 2013. The exhibition stands out by presenting paintings and sculptures created by artists from a single province. "The goal of the exhibition is to introduce the artists of Bayankhongor Province, share experiences, and encourage them," said the organizer of the exhibition. A painting called "Flower" by artist N.Orosoo was a beautiful creation. The painting includes pink, rose, yellow, and green using watercolors that makes the painting come alive. As the summer days approach, the painting caught my eye as we all eagerly await those colorful summer days.